Switzerland has got to rank No. 1 in our list of favourite places to visit. 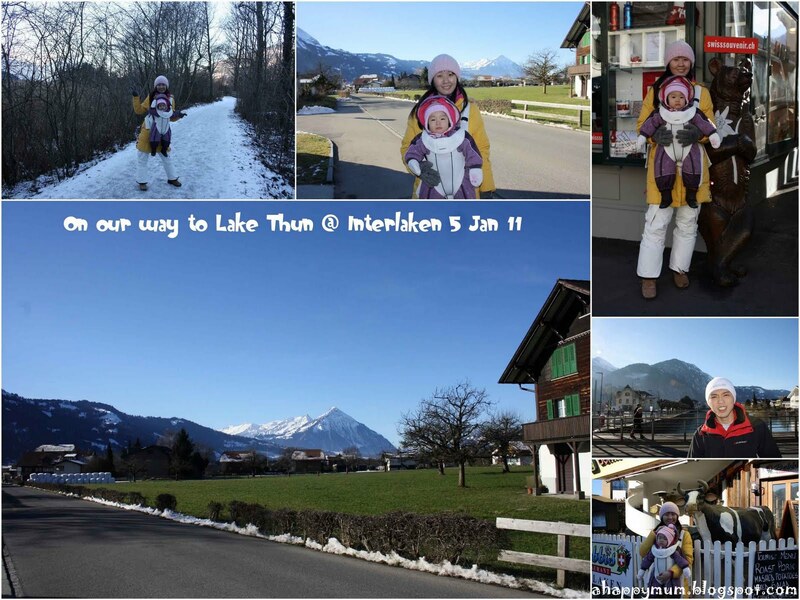 We were bowled over by the alpine beauty and astounding panorama of this picturesque country. Since we visited it in January when it was still the winter season, the mountainous peaks and luxurious countryside were all covered in a heavenly blanket of snow. The beauty of it all was really so surreal but I had to frequently pinch myself to remind me that this was not a dream, it was a dream come true. Our only glitch on this trip was despite my cautious and meticulous packing, we forgot to load the most important item onto the car : the Maclaren stroller and happily drove to Copenhage airport. That left us pram-less for the rest of the trip when we had a 10-kg freight, who could only crawl but not walk, to lug with us everywhere we went. Ok. I was quite hysteric when I realised it. I was prepared to buy tubes of Counterpain and Salonpas pain relief patchs at the airport. If you don't understand why, try carrying a 10kg weight on your shoulders just for 2 hours straight and you will empathise with me. However, it was an ill wind that blew some good. Angel was quite delighted at the whole experience because 1) She got to see a clear view everywhere she went, 2) She could be the star of every photograph, even if she was sleeping in my chest, 3) She wouldn't feel so cold since our skins were rubbing all the time. So, miraculously we survived with our Baby Bjorn carrier by taking turns to carry Angel every 2-3 hours for the next 8 days. We didn't use any pain relief like I'd thought, but both of us were indeed in dire need of a good traditional Thai massage every night. Which could only happen in our dreams as we were too exhausted to massage each other. 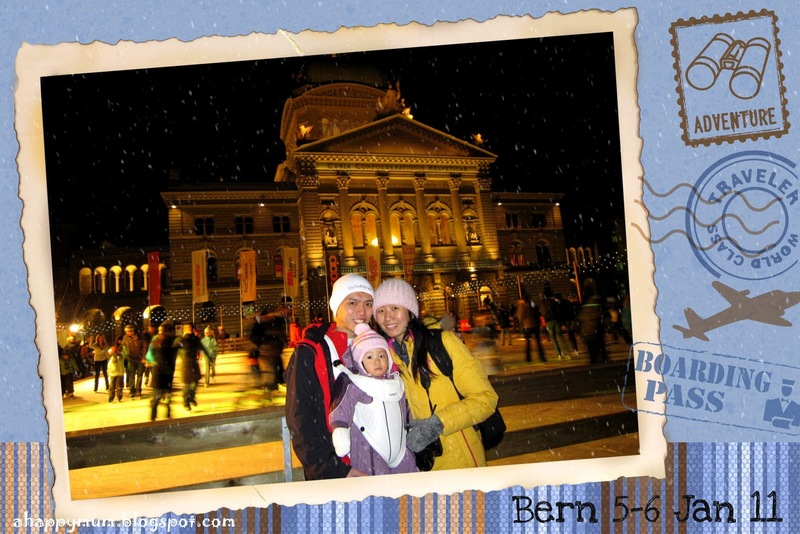 Anyway, back to the trip, in a span of 8 days 7 nights, we visited 4 beautiful cities namely Zurich, Interlaken, Bern and Lucerne. 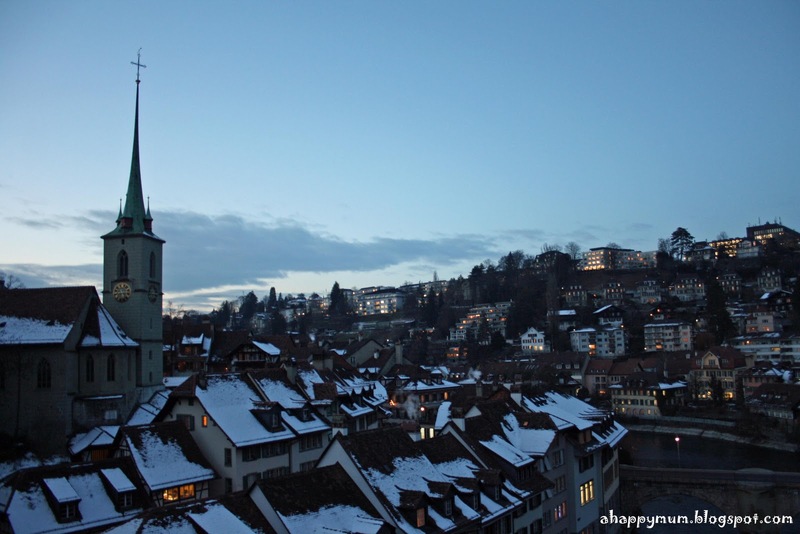 The city of Zurich lies in the centre of Switzerland and is a mix of contemporary attractions like museums, art galleries, theatres and fashion boutiques. As a metropolis and important financial hub, Zurich is very urbanised, developed and well accessible. 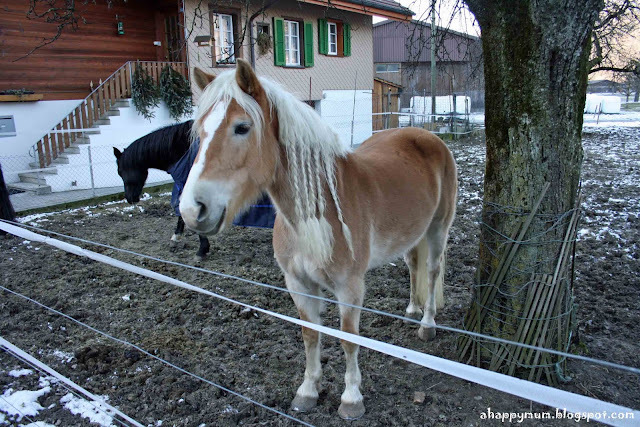 An interesting is that it also boasts the highest density of clubs in the whole Switzerland. Not that we had any chance of entering the clubs when we had a screaming 1-year-old baby with us. Not even when we tried to argue that she was the cutest girl in the whole club. 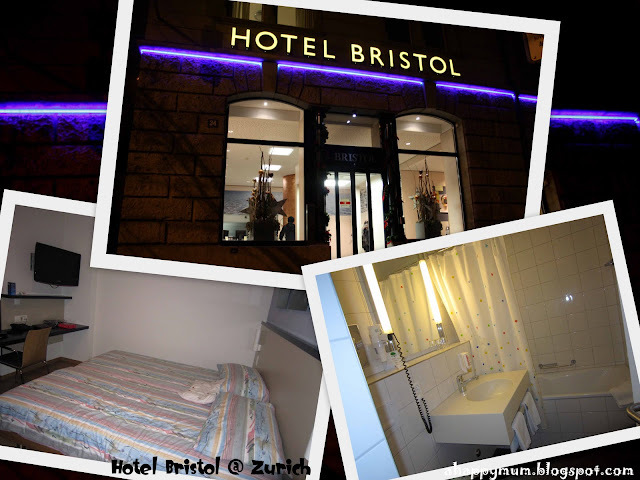 We stayed in Hotel Bristol in downtown Zurich. 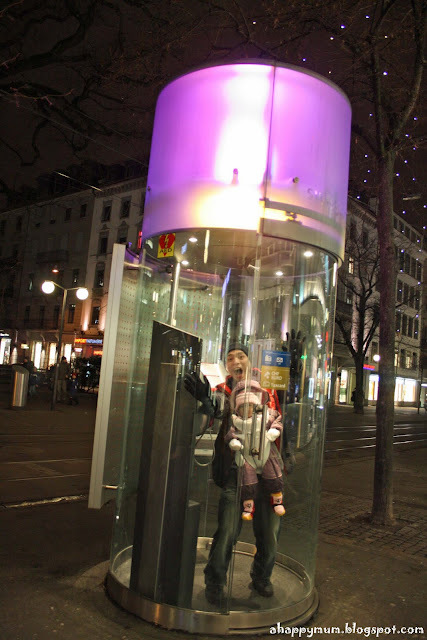 Alas we took the wrong turn when we came out of the main train station and ended up walking for half an hour with our oversized luggages, plus a baby, when it should only take us 10-mins. But I'm starting to just laugh it off whenever hiccups like this happened. Positive thinking is the key to a fun-filled vacation! 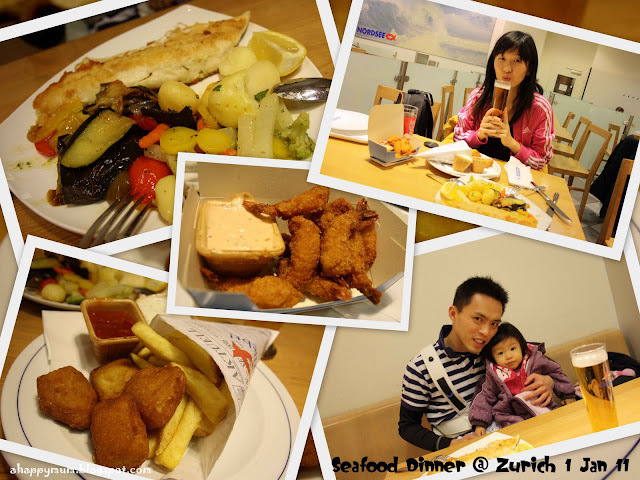 We rewarded ourselves with a nice seafood dinner on our first night in Zurich. 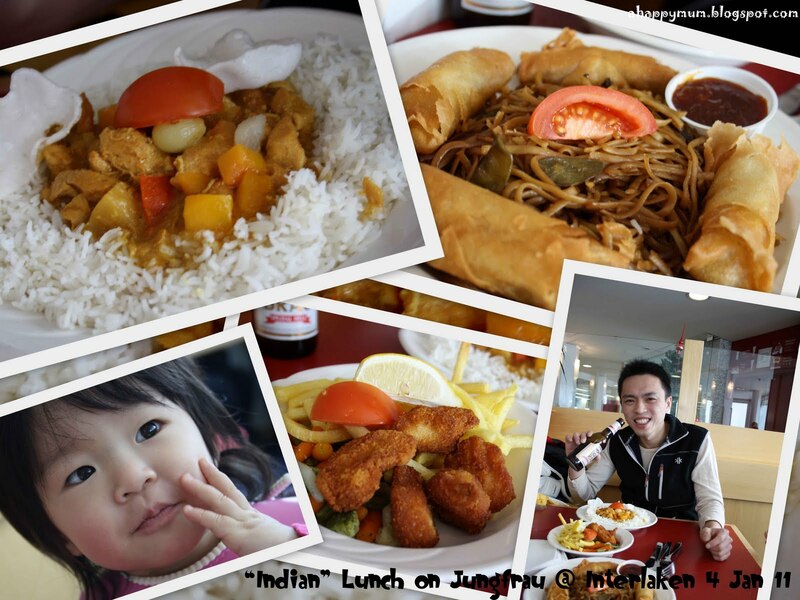 I ate deep fried king prawns, jw had sea bass while Angel had golden nuggets. 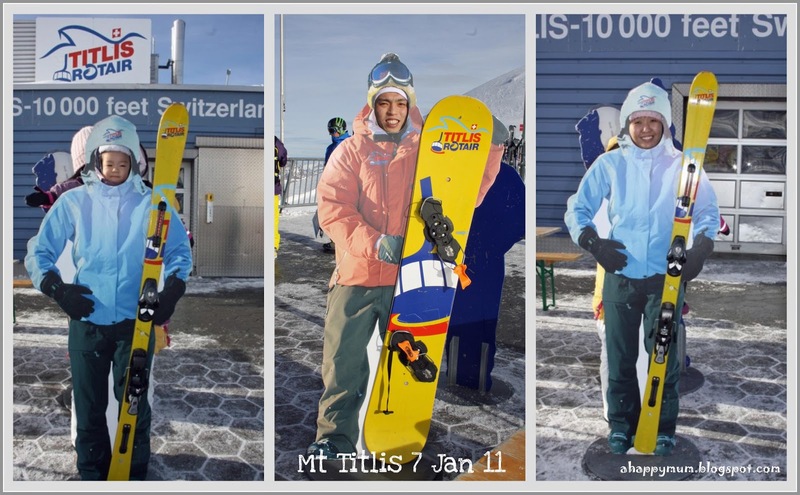 I didn't know why but people had a tendency to stare at us whenever we went. 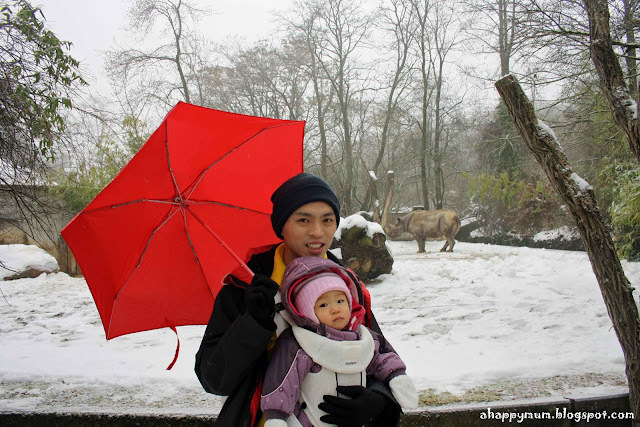 I attributed it to my cute baby or that it was quite uncommon to see a daddy carrying a baby instead of the mummy. 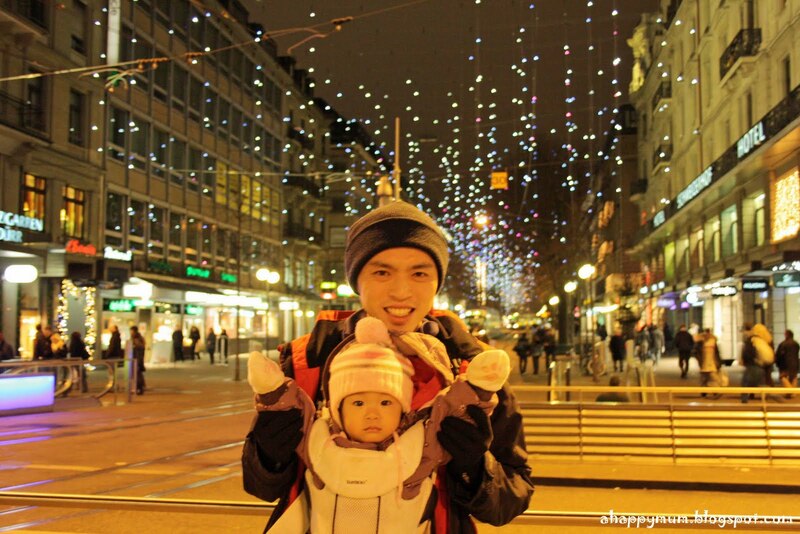 We did a little shopping along the main shopping street of Zurich, Bahnhofstrasse. The one big stopping factor I had from doing more shopping was not money, but the fact that the more we bought, the more we would have to carry and there was no pram for us to just hook the bags onto as what we normally did. 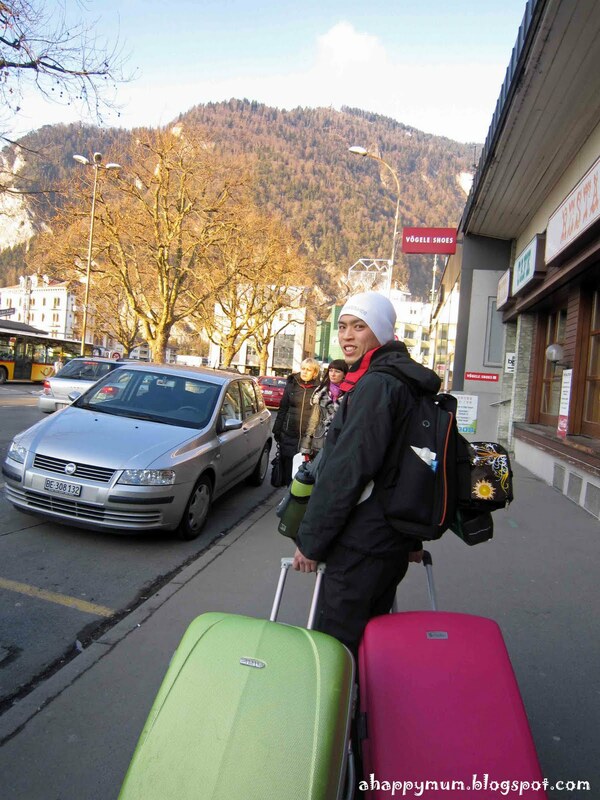 Anyway, our top priority on the Swiss trip was not shopping, we were more keen on witnessing awe-inspiring scenery. Angel was probably the happiest person on the trip. Ok, I'm also very happy too, but maybe 99% of hers. She had tonnes of things to play, to eat and to see. Kids, aren't you jealous of them sometimes? 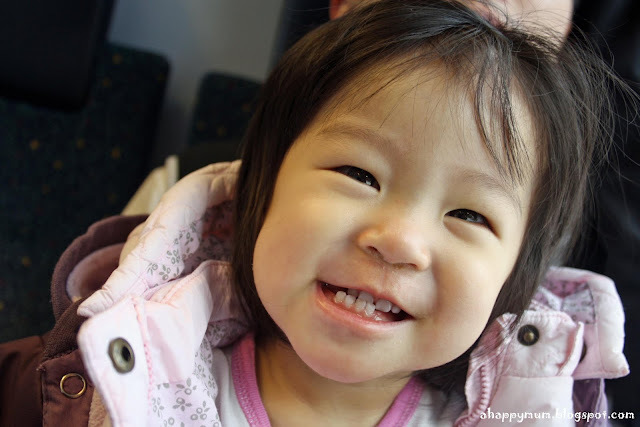 But seeing her big wide smile never failed to warm our hearts and also helped us lessen the shoulder ache. For her, everything was worth it. Soon it was nightfall in Zurich. The shopping street looked even prettier when the lights came on. The good thing about bigger cities like this was that the streets were still very busy and crowded at night even after the boutiques were closed. Back in Karlskrona, you could hardly see people in the evening. Shops close at 6pm on weekdays, half day on Saturdays and are totally closed on Sundays. That is the European tradition and something very different from Singapore where shops and eateries can open for 24hours. We had fun taking some wacky shots like what we would always do. Who cares if the people were giggling or saying "Hmm, how weird these Asians are." 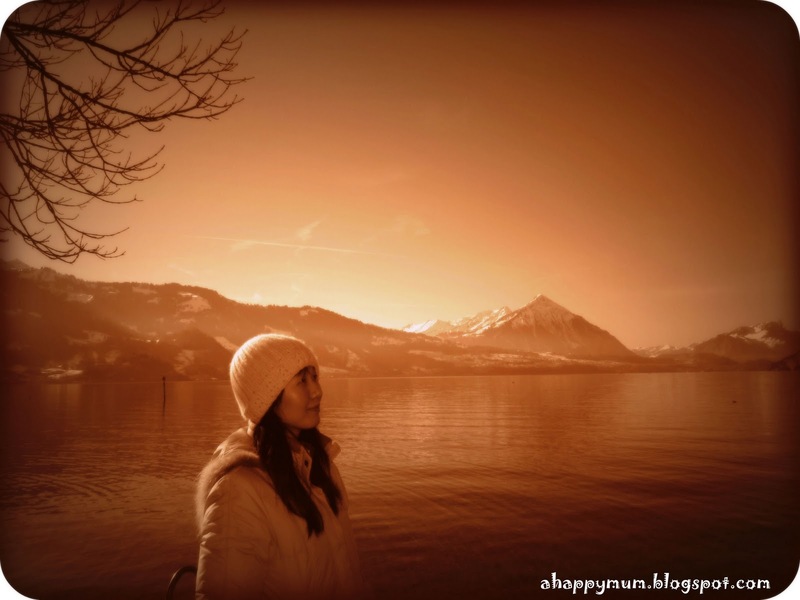 We also walked along Lake Zurich and explored the Old Town which was nearby our hotel. 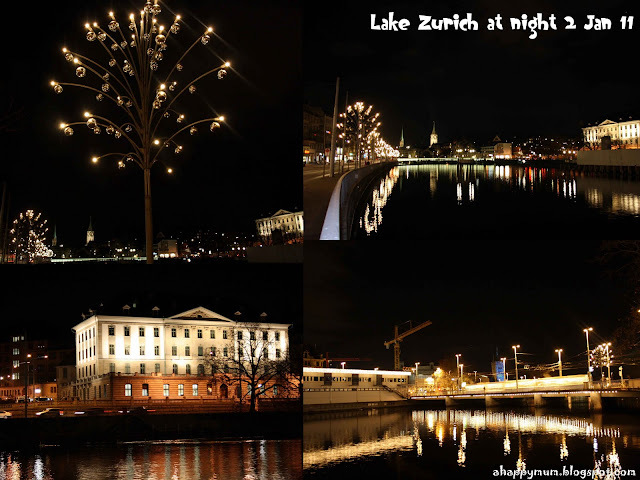 Lake Zurich didn't jump out to me as impressively fine-looking but we had a pleasant and peaceful stroll alongside. At the Old Town, we were thrilled to find a Malaysian restaurant and we had delicious roasted duck noodles and dumpling soup for dinner. On Day 2 of Zurich, we decided to visit the Zurich Zoo. Yup. 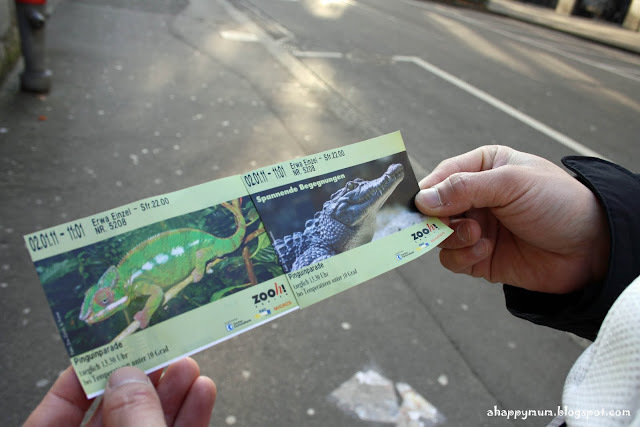 You would realise how we loved to visit zoos on our overseas holidays. 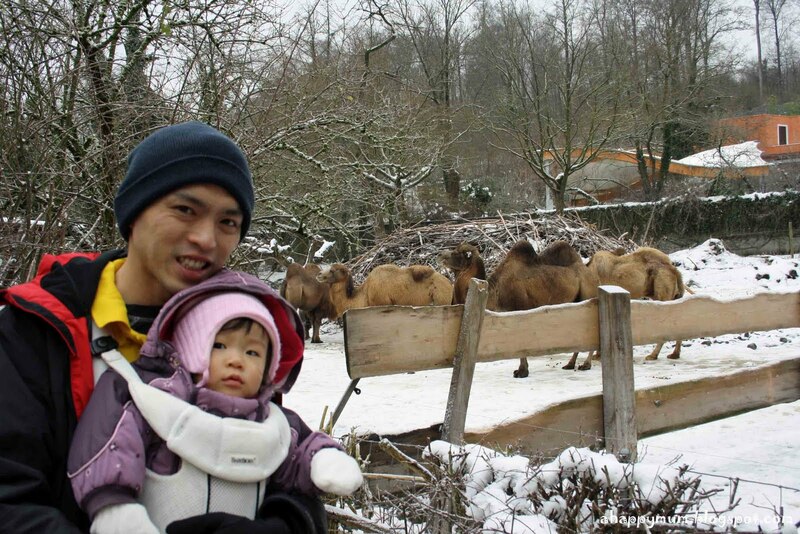 I don't know of any fellow friends who can beat our record in the number of overseas zoos we had visited. It is not because we are fanatics of orangutans or chameleons, it is entirely because we know how Angel loves animals (which kid doesn't?) and we thought it was only fair that she got a day off to visit things that she loved instead of just following us wherever we took her to. 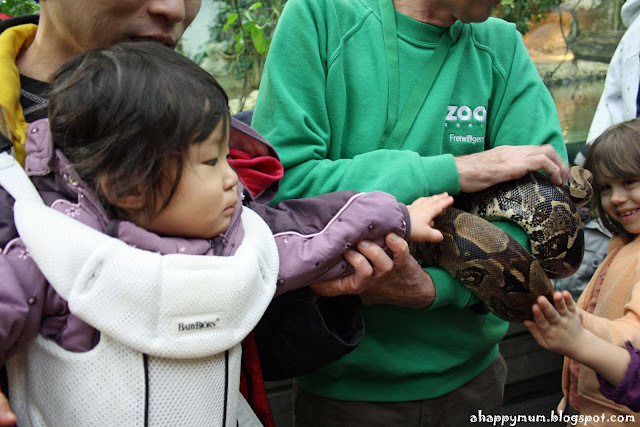 You should see how her face lights up whenever we go to the zoo and she gets to go close to animals or even stroke them. That, is the reason why. 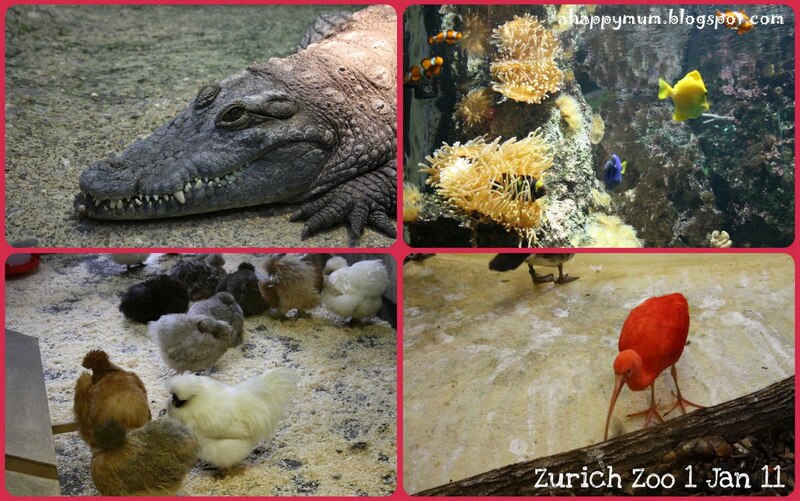 The Zürich Zoologischer Garten has over 2200 specimens of 300 species. 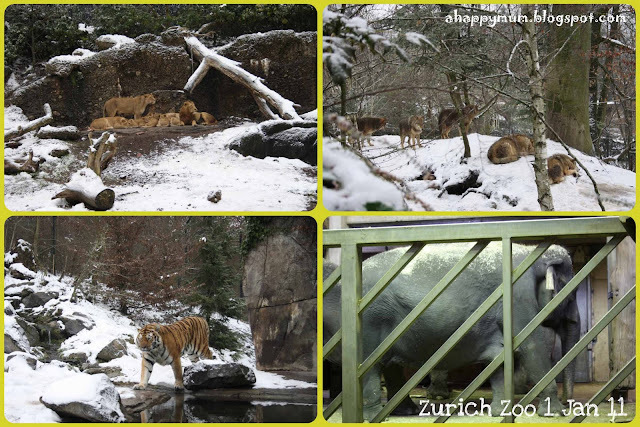 What made it such an unique experience for us was that we had never been to a Zoo in the middle of cold winter where the animals were all in a snowy environment. I still feared that the animals would be hiding away from the cold and we wouldn't be able to see much. I was wrong. 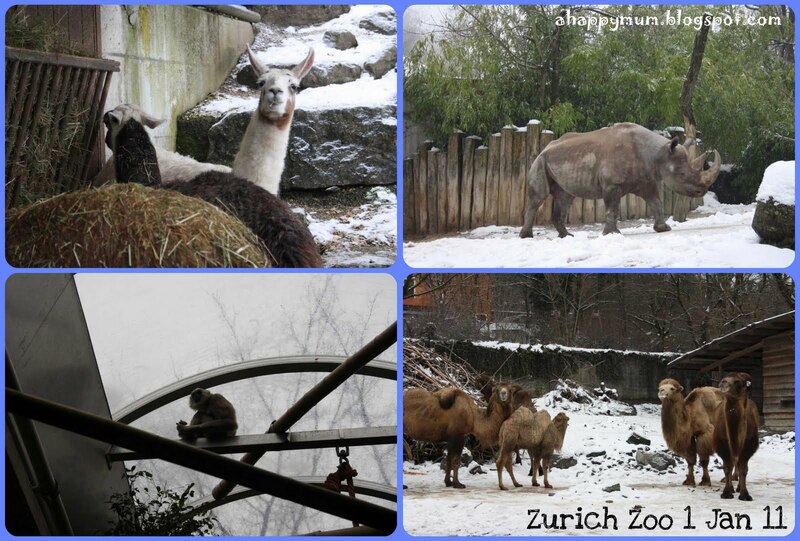 This zoo proved to be one of the best zoos we had been to. From the Galapagos giant tortoise to European otter to Asiatic elephants, we were able to get up close and personal with countless animals, many of which we were seeing for the first time. The Zoo also offered a Masoala Rainforest which allowed visitors to experience the natural world and step into Madagascar’s animal and plant kingdom. I think my baby probably has much more guts than me. Not only does she dare to ride on thrilling roller coaster rides, she is also not terrified by strange looking creatures. At the Zurich Zoo, she even touched a slithery huge long python. Thrice. Probably it's true that the older you get, the more fears you'll have. Anyway, after a good long day at the zoo, it was nearly time for us to bid farewell. 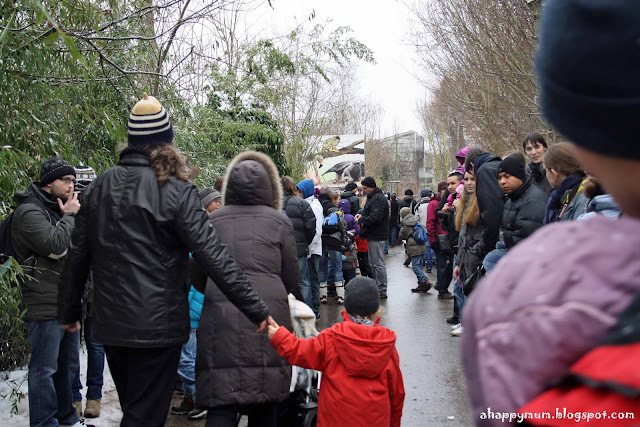 As we made our way out slowly, we were intrigued and curious when we saw a long line of queue along this particular stretch of road. To our joy, we were in for a rare treat. 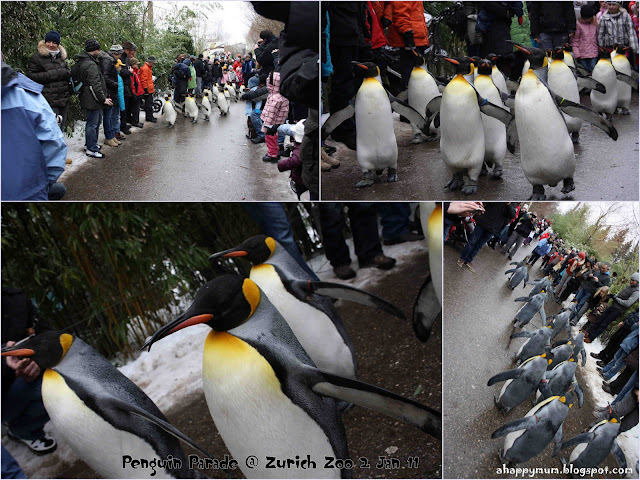 It was time for the popular penguin parade, which was performed only if the outside temperature was below 10 degrees celsius. Come on, where do you get to see a penguin parade back in Southeast Asia? The penguins were amazingly obedient and didn't really go out of line or break free, though one seemed like she was interested in one of the handsome looking onlookers. =) Really cute. 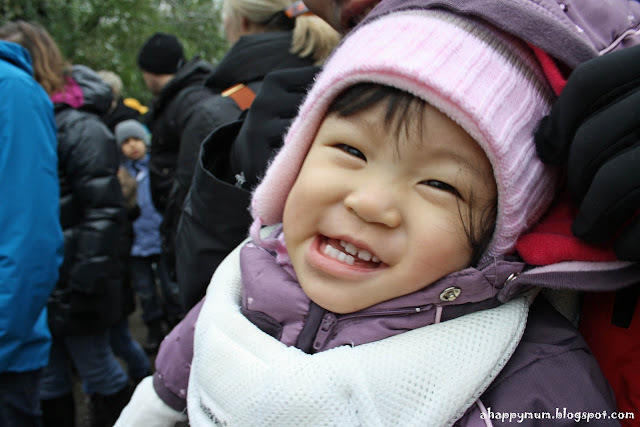 Angel couldn't stop smiling when the penguins came out. I guess she really enjoyed the show. Lucky us! I was very much looking forward to visiting Interlaken because I was told that it is a very beautiful place and definitely a must go if you visit Switzerland. 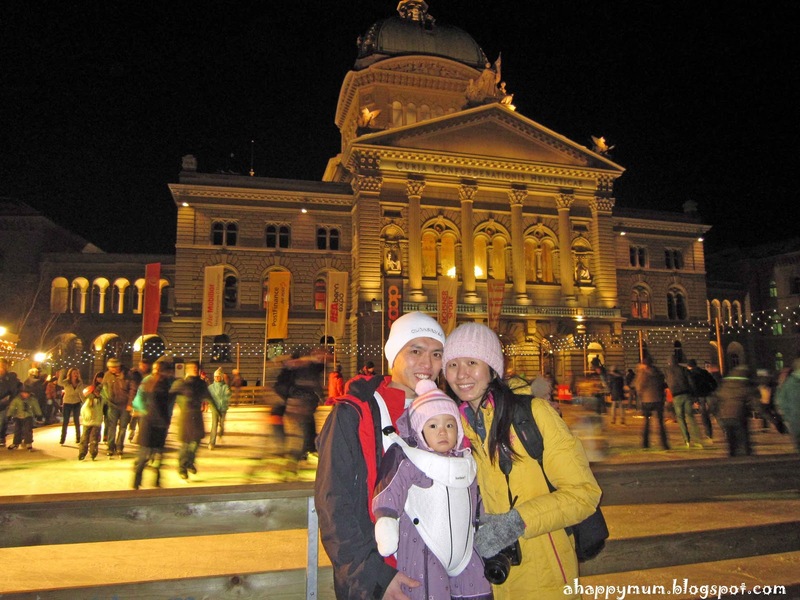 Well, I soon discovered why this seemingly small but unperturbed city could become one of the top tourist attractions in Switzerland. 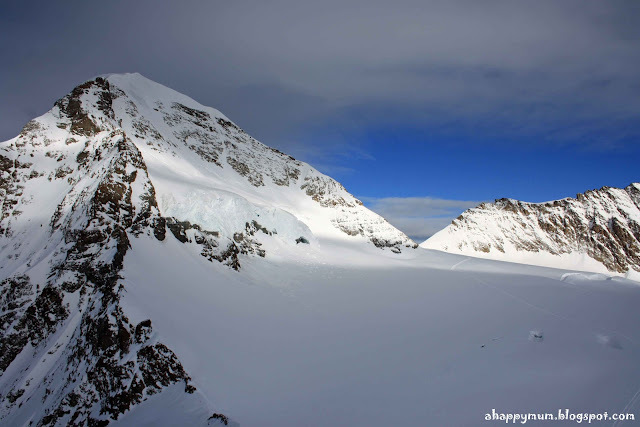 Its abundance of steep cliffs, snowy mountains,beautiful lakes and rivers makes it a scenic paradise. 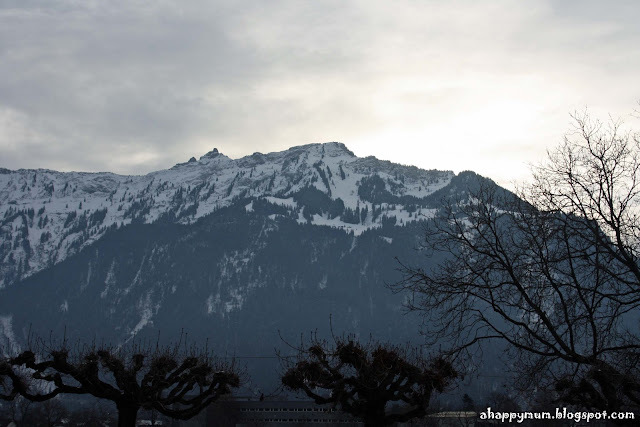 There exists a legend about Interlaken, whereby God sent an angel to adorn the earth but as he arrived in Interlaken, he had used up his trimmings in other areas. He felt pity for the barren area, therefore he searched his bags and used the last but most beautiful embellishments in this town. We stayed in City Oberland which we discovered was a pretty popular choice among tourists. For a standard double room, its room was very clean and there was even a bathtub. When you have a kid, you will know why bathtubs are so important. Anyway we are not the type who are very strict about lodging, so we usually go for 3* hotels since we would be out for over half the day. All we asked for was a clean bed to sleep in and a roof over our heads. We had dinner in a Korean restaurant on our first night and talk about coincidence, we bumped into fellow Singaporeans who were on a Switzerland/Italy tour. 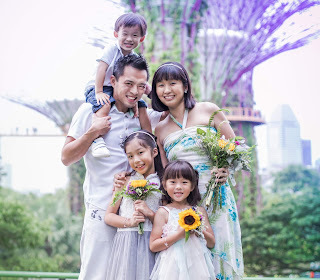 It's funny how Singaporeans can always identify Singaporeans, not from the way we dressed, but from the way we talked. 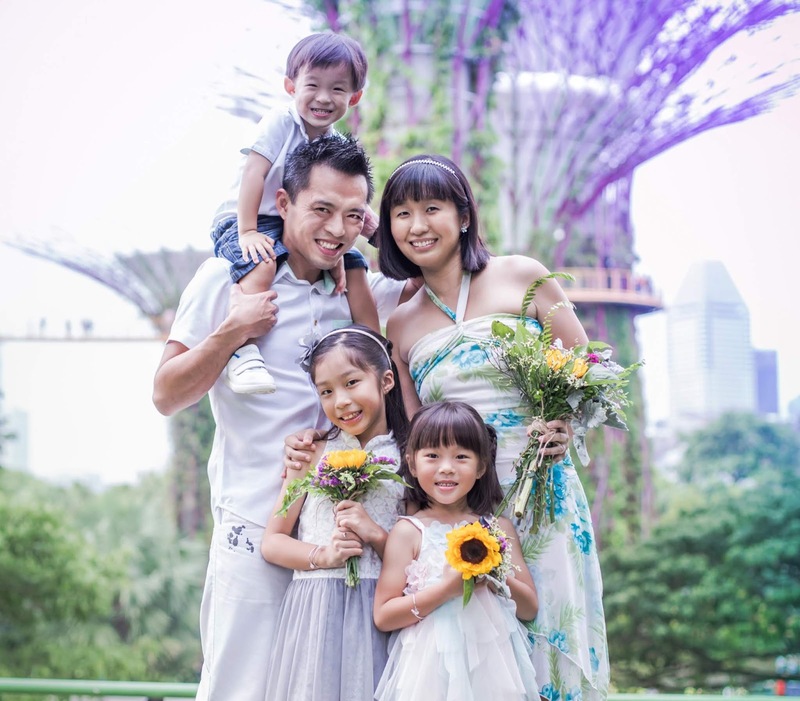 That unique blend of Mandarin and English, plus the one-of-a-kind Singlish. Anyway I realised that my noodle soup was made from instant soup packet, which was rather unimpressive since I thought we could eat authentic Korean food. Still, no complaints since it was quite delicious (of cos, with all the MSG) and as long as it filled my stomach, I was contented. 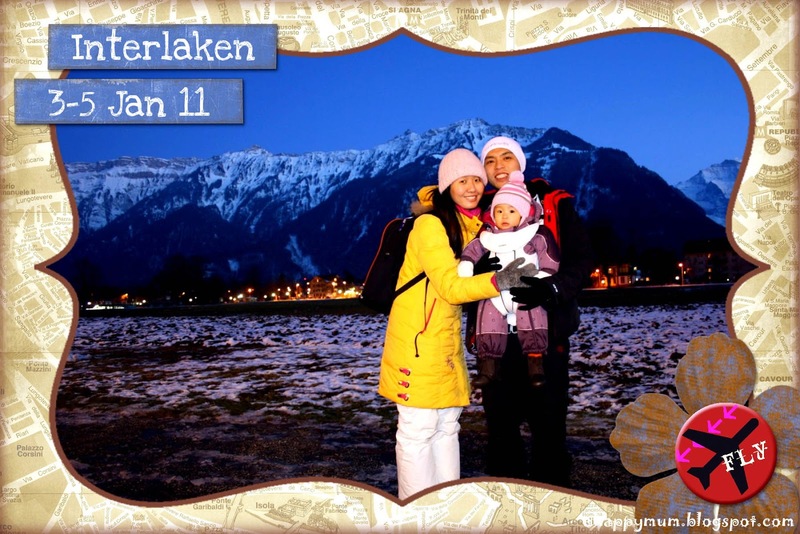 Day 2 of Interlaken was one of the biggest excitements of the entire trip. 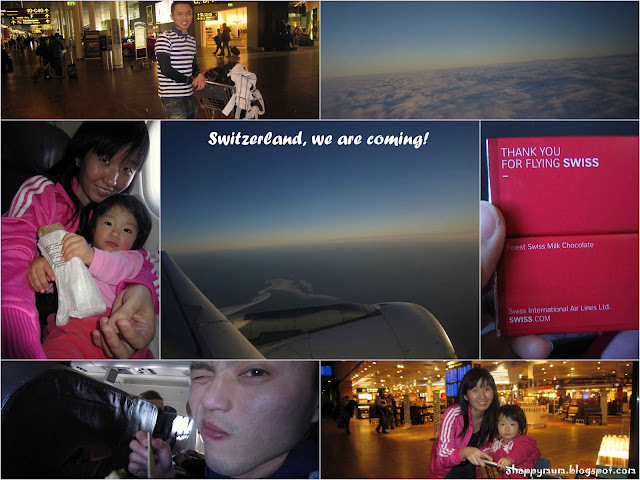 We were going up to visit the Alps! Honestly I only remembered seeing the Alps appearing in movies like The Sound of Music, James Bond, The Italian Job and Just Married. Before I came to Europe, I probably didn't even realise how real or magnificent they were, not to mention even dreaming of visiting them one day. 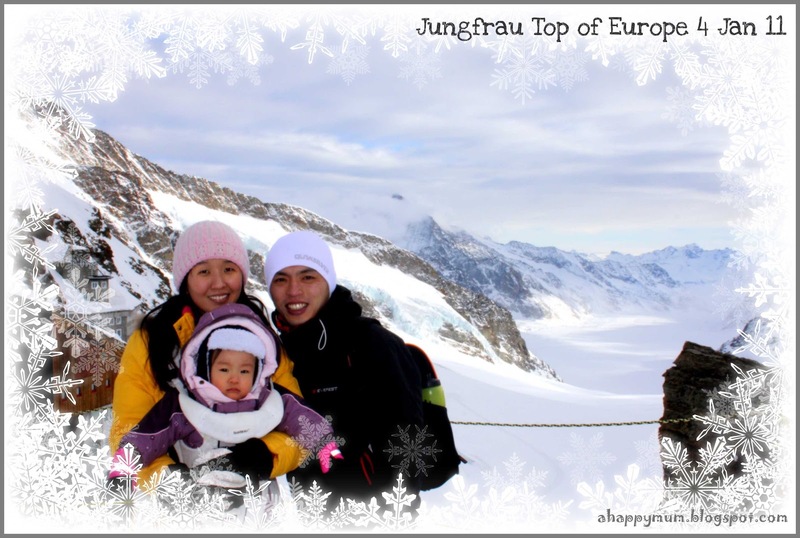 The Jungfrau, standing at 4,158 m (13,642 ft), is the third highest summit in the Bernese Alps. 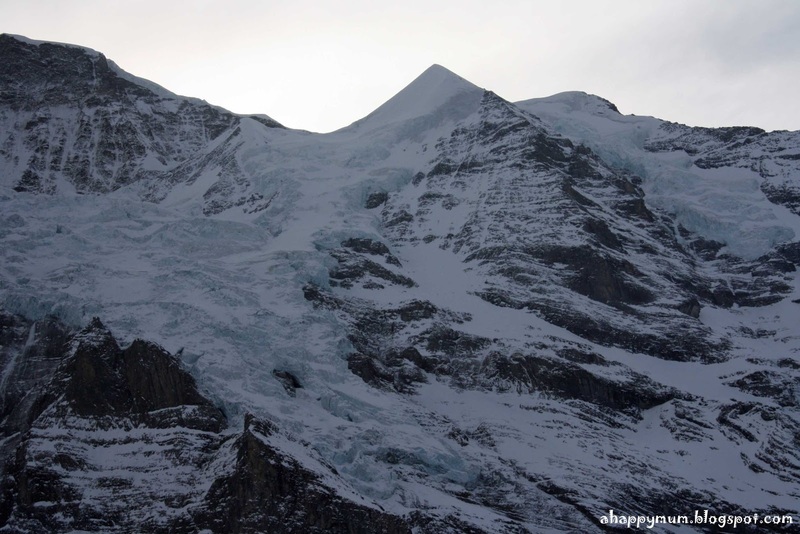 Together with the Eiger and Mönch, it is considered one of the most symbolic sights of the Swiss Alps. 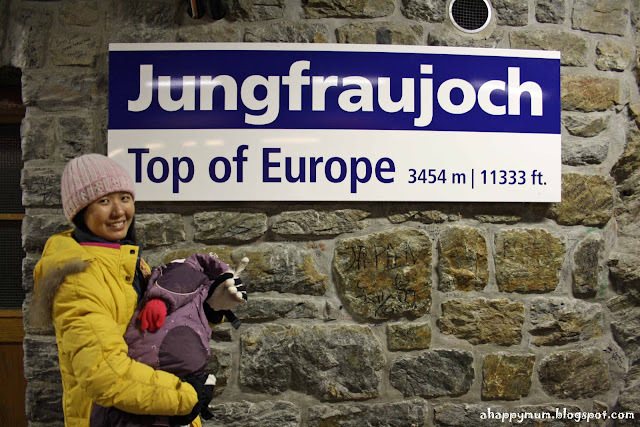 Our excursion was to Jungfraujoch, which at an elevation of 3,454 meters (11,332 ft), is the highest railway station in Europe. Therefore, it is commonly referred to as "Top of Europe". Yeah we like the sound of it, "Hey, we've been to the Top of Europe!" 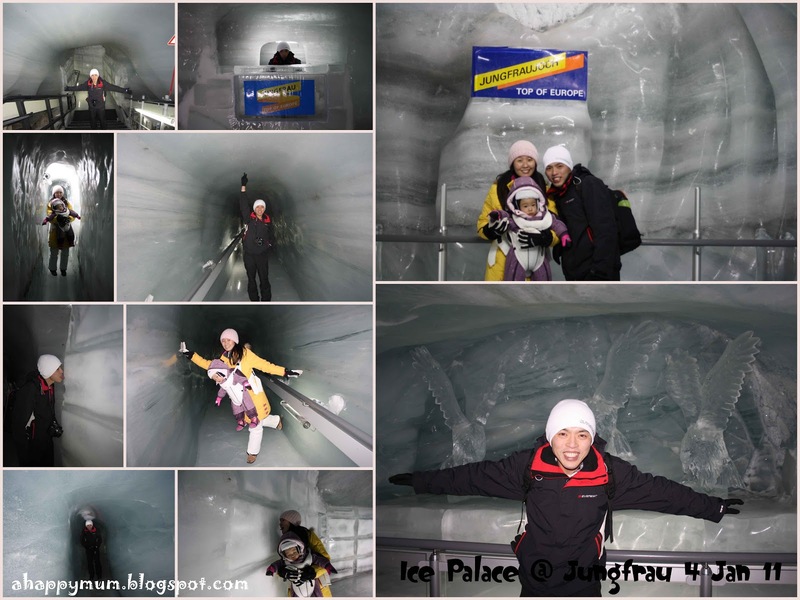 It took us a 2-hour journey by train to finally reach Jungfraujoch. My baby learnt to hold onto books and even tried her very best to guide us with the train time schedule. Ok. I honestly don't know what she was looking at so intently but there were no cute boys in the book. I brought two thick jackets for her today knowing that it would probably be freezing cold in the mountains. But since she is a proud survivor of dog sleighing when it was minus 25 degree celsius, I kind of felt confident that this would be chicken feat for her. I couldn't help it but snapped away as we were on our way to Jungfraujoch. That was simply because I was already so taken away by the beauty of it all. Anyway I had a 16GB card for my DSLR and a 4GB card for my digital camera. And with digital technology nowadays, if you don't like a photo thereafter, just hit Delete. But if the moment passes and you didn't get a shot, you might just live to regret it. Or end up being a cheaterbug and grab a nice picture from Google Images. 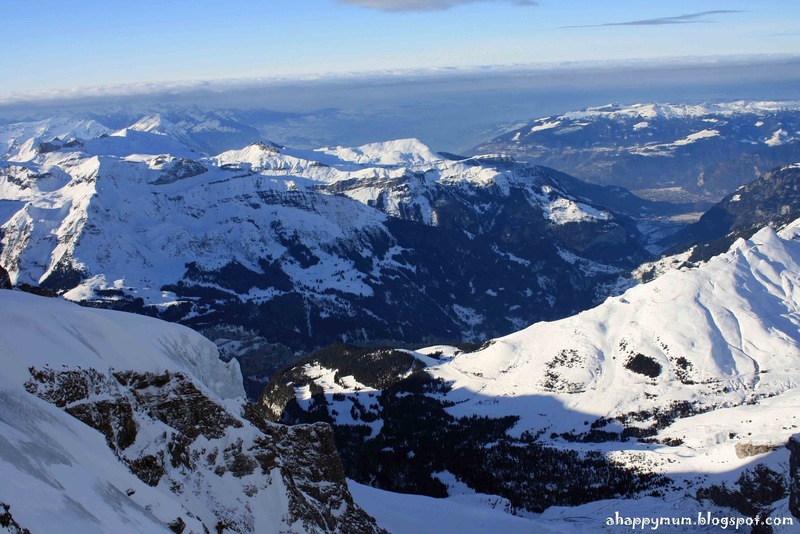 Glaciers to me were a mystery before I first saw one in Switzerland. Ok, maybe I did learn about it in Geography class but I was probably sleeping behind my textbook. Anyway, this is what I gathered online. 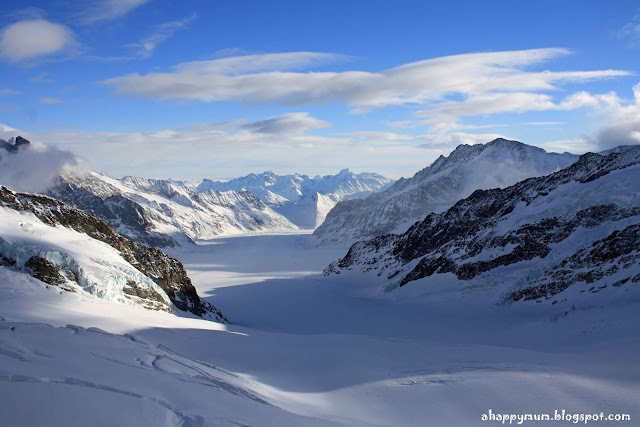 Glacier - A large mass of ice moving very slowly through a high valley (alpine glacier) or spreading outward from a center (continental glacier). 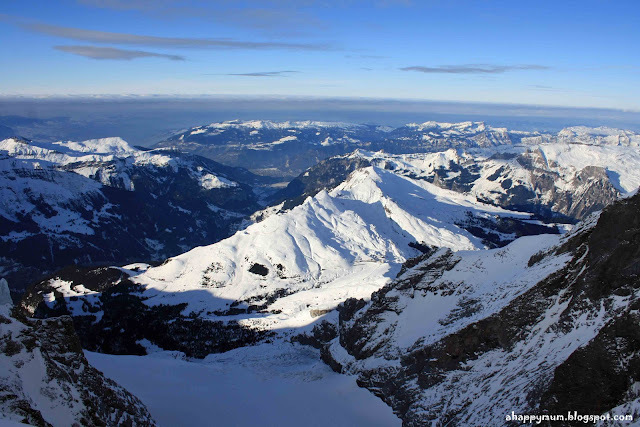 Glaciers form over many years from packed snow in areas where snow accumulates faster than it melts. 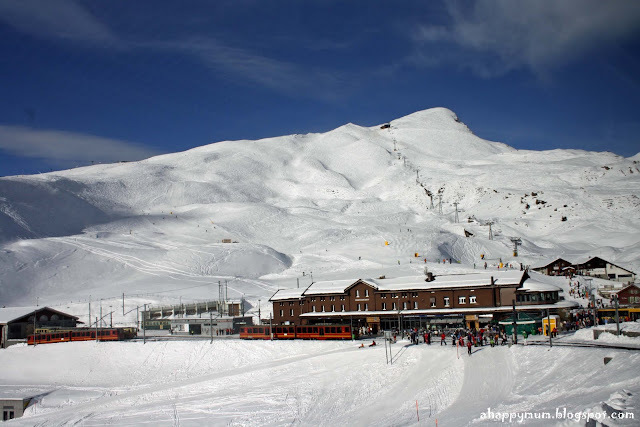 We also saw a number of ski lodges and a endless stream of ski junkies. Now that I had tried skiing before in the last Christmas holidays, I could totally understand why it is so fun and addictive. It gives you a sense of adrenaline rush and thrill different from other sports I know. And hey, I've at least played tried 10 sports before in my life, ok. Finally, we were at the Top of Europe! Yippie yay yay! 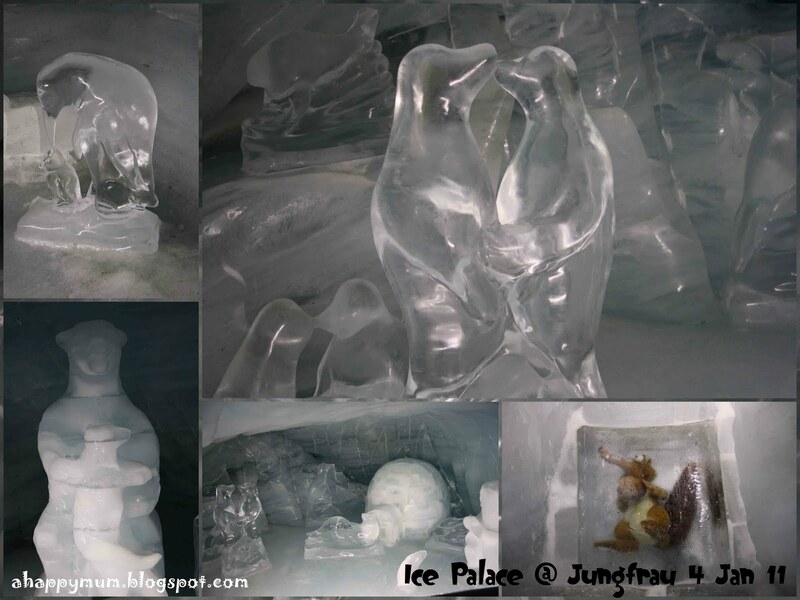 We visited the Ice Palace which showcased a variety of rather intricate ice sculptures. There was even Scrat and his acorn (from Ice Age) all frozen up in an ice cube. My personal favourite would be the kissing penguins. As we stepped out onto the viewing deck, I could only describe the scenery as breathtaking. The photograph above could easily become the most beautiful scenic picture I had ever taken with a digital camera. It really took me awhile to absorb the magnificence of this surreal surrounding I was in. We then took an elevator to the summit where the Sphinx Observatory was located. Well, we needed to walk quite a distance to the observatory, and halfway through my hubby suddenly said he felt breathless. So he leaned against the rock wall and tried to catch his breath. Of course this was due to the high altitude and lower atmosphere. The funny thing was, I didn't feel it. I attributed it to Angel lying on his chest thus worsening his breathing and I just hoped that Angel was not feeling it. 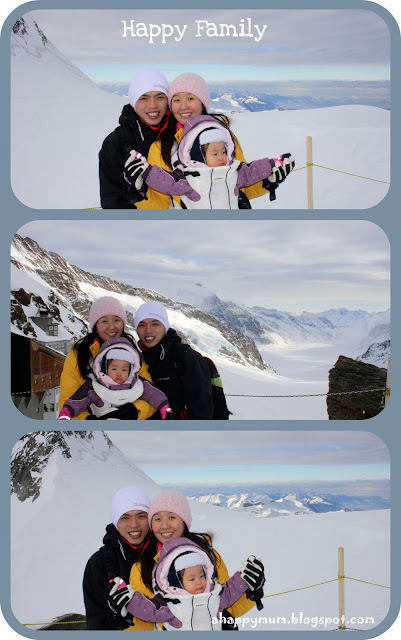 She could nap, so she probably was ok.
We had lunch on Jungfraujoch to mark the end of a wonderful afternoon. 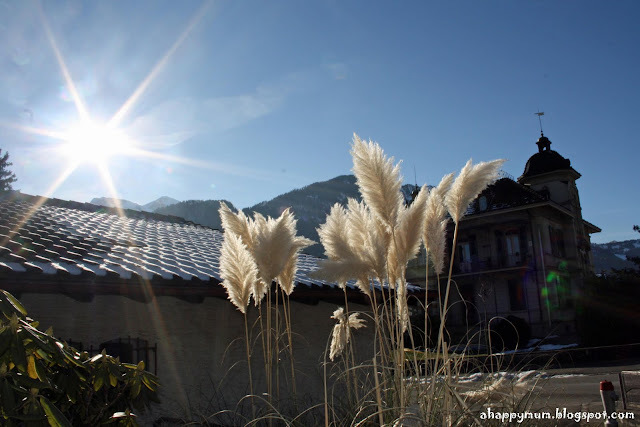 Though the Indian food we ordered was not Indian at all, it truly didn't really matter to me because I was still immersed in the beauty of the Alps. I might even have eaten crocodile meat if you gave it to me then. 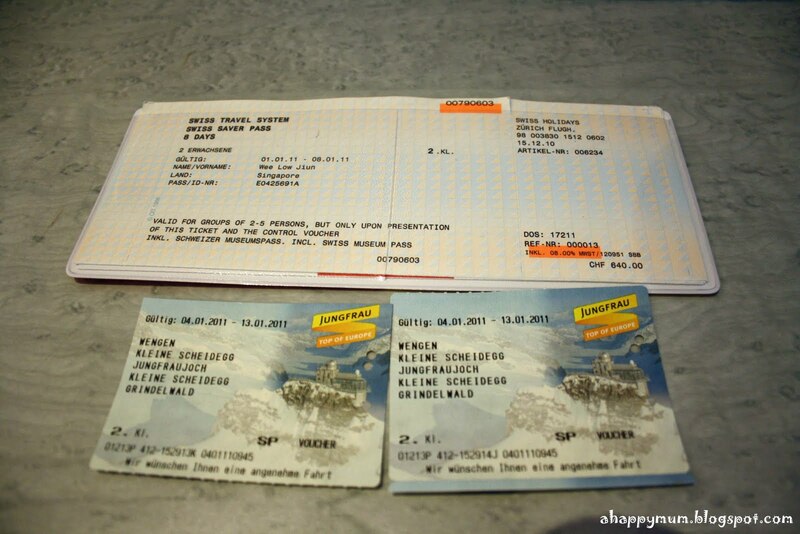 There, we bidded farewell to Jungfraujoch and took another long journey back to Interlaken. Nonetheless, this had to be one of the best excursions I ever had. At night, we were too lazy to travel out for dinner so we decided to eat in at our hotel. 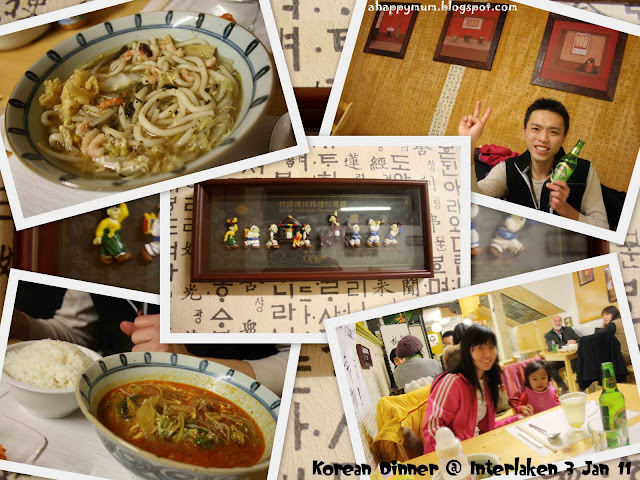 It proved to be a smart choice after all because the food was good and entertainment was great. There was this friendly old Swiss couple who were playing the accordion and that fascinated Angel who kept swaying to the music. 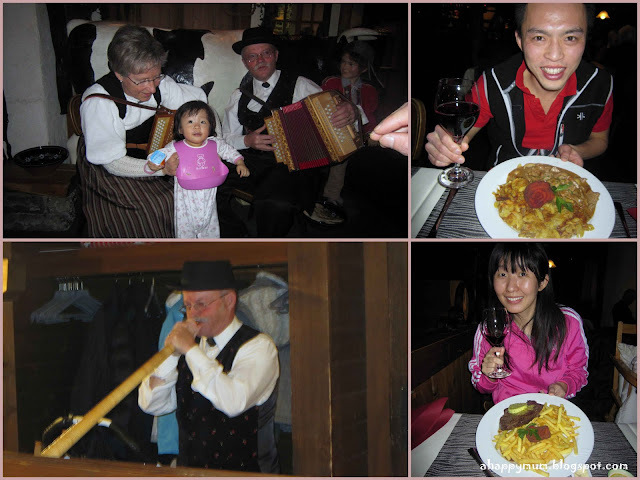 Jw also got to try the Alphorn, a traditional musical instrument in Switzerland. The old man made it look so easy but it was much harder than we thought. You should check out jw blowing it in my video below, it was hilarious when he first tried because there was absolutely no sound. 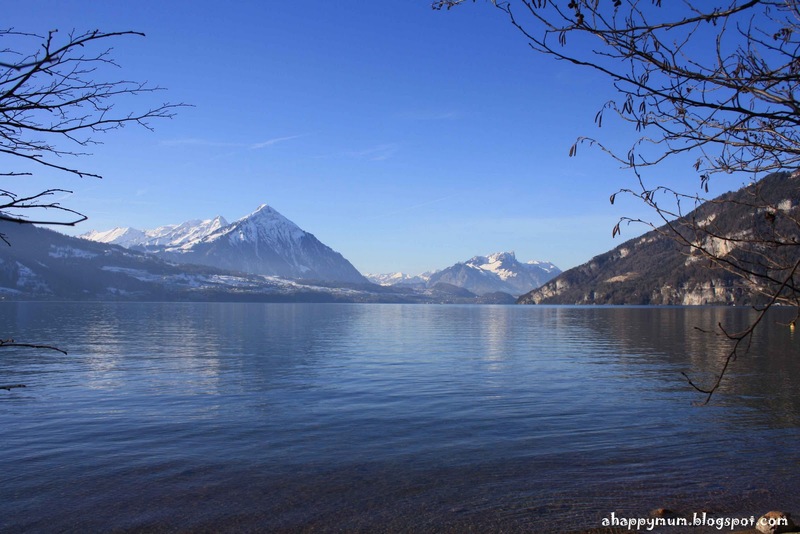 Before we left for Bern the next morning, under my request, we walked to Lake Thun in the hope of finding more pretty scenery. I didn't know why but I just thought we had to go and see it since we were there. I made a choice too smart for my good when I offered to carry Angel for the entire walk. My intent was to take some Mother-and-daughter pictures at the lake and I thought it would be a mere 20min walk. To to my dismay, we walked for over one hour but somehow I was strong enough to stick to my initial plan. I think I could be the next Xena. Luckily, there was some nice scenery to see along the way and the weather was kind to us that morning. We saw this charming brown horse which had cute looking plaits on its mane. At last, we were at Lake Thun! Fortunately, the beautiful sights I saw was more than enough to make up for the long and arduous walk. The lake was tranquil, peaceful and quaint - definitely the prettiest one I had seen. 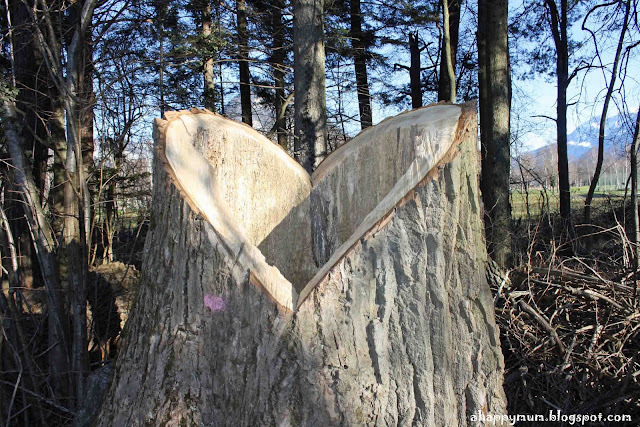 This tree had an interestingly heart-shaped trunk after being chopped. How could the hopeless romantic in me miss taking a shot of it? There, I took another yet amazing scenic picture at the lake. I have to tell you that I am no expert at taking photographers despite I bought a second hand DSLR to make myself believe that I can be a good one. All I usually did was point and shoot, and to be able to capture a shot like this, it had to be because the background was perfect. All I had to do was find the right spot, hold my camera and press the button. Voila! I definitely felt grateful that we made it to Lake Thun for it was truly a gorgeous little heaven. 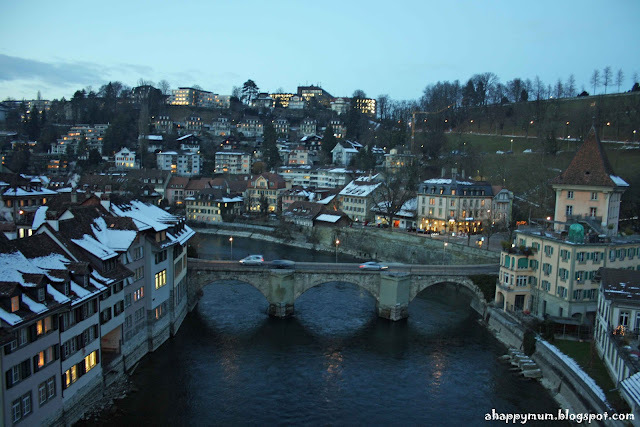 With that, we bidded farewell to the pretty wonders of Interlaken and made our way to the third destination - Bern, the capital of Switzerland. 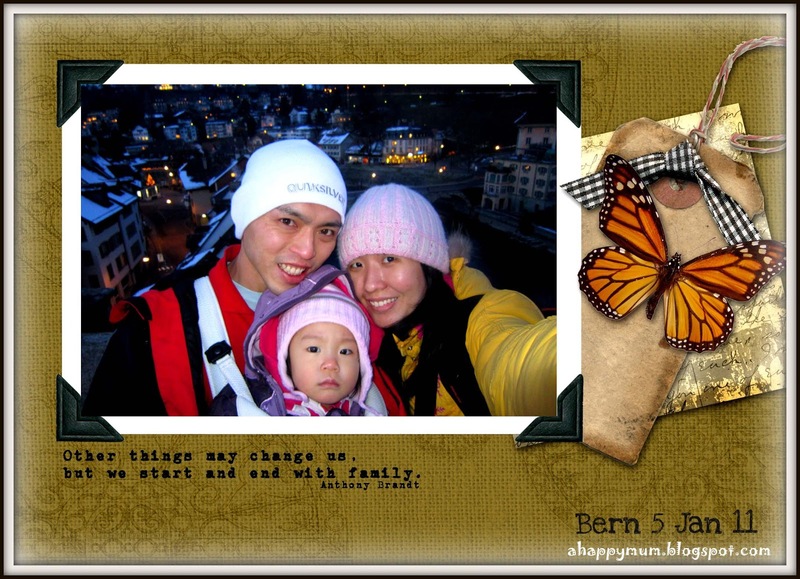 Bern was the one place that appealed to us more than we thought it would and was totally beyond our expectations. We loved how the old town managed to capture its historic features and present them in a contemporary, charming and elegant look. The medieval architecture, sandstone facades, fountains, statues, historic buildings and narrow streets added up to give this city a truly unique feel. Much as we felt welcomed by the city, sadly we did not feel the same greeting at Hotel Kreuz where we stayed for the night. Firstly, the toilet flush was malfunctioning and was an annoyance through the night. Secondly, we had to pass the pantry to get to our room and when we did so, we saw this huge rat scuttling across the floor. Yeewwww. All I hoped was that it didn't come chasing after my cute baby or leave its poop as a souvenir on my breakfast for the next day. 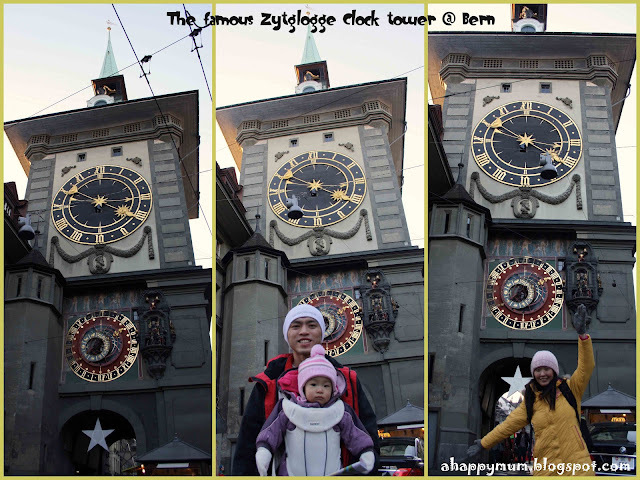 One of the most famous landmarks in Bern was the medieval Zytglogge clock tower. Every four minutes to the hour, there would be a display by the mechanical figures - including a crowing rooster, a parade of bears, a lion and a knight. This was always a crowd-drawer and it was also a common meeting point since it was right in the middle of the old town. The Münster of Bern is a gothic cathedral and the tallest cathedral in Switzerland. 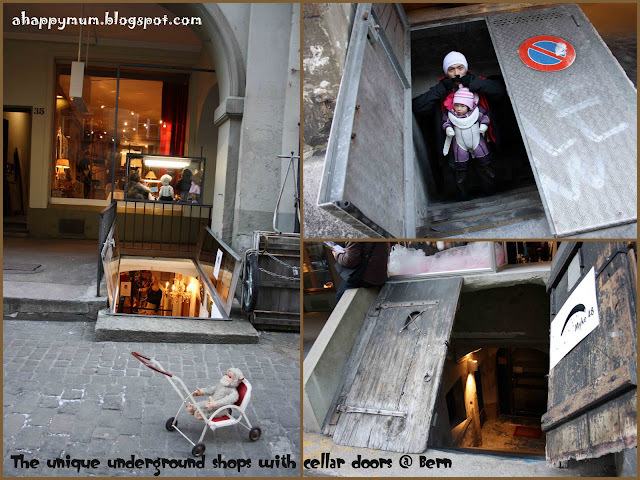 A special feature of Bern which I found really intriguing was the underground shops which were like cellar vaults. They had huge cellar doors which opened outwards and steep stairs which led the way down. You had to really be cautious when you went through but it was definitely something unique. How could a Swiss holiday be complete without any Swiss chocs? 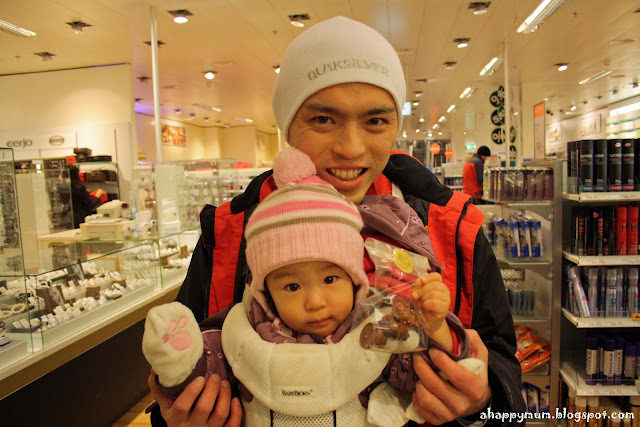 You can be sure that we pretty much bought chocolates as we moved along and we usually devoured them pretty fast. Ok, we made sure we shared them equally. Nearly. "There are very old arcades stretching along both sides of the streets, so you can walk from one end of the city to the other in the worst rain practically without getting wet." Bern is also well known for its bears, and takes its name from the German word "Bern" that means “bear”. 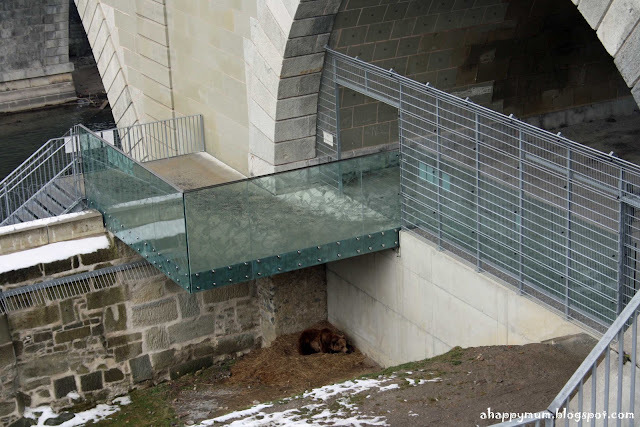 Legend has it that a bear was the first animal to be caught by city founder Berchtold V. von Zähringen during a hunting expedition in the area, and therefore named the city Bern. Since the bear is such an symbolic representation of Bern, we felt that we had to visit the Bärengraben, also known as the Bear Pit. In fact, we made two trips to the park since all the bears were sleeping on the first trip, much to our disappointment. 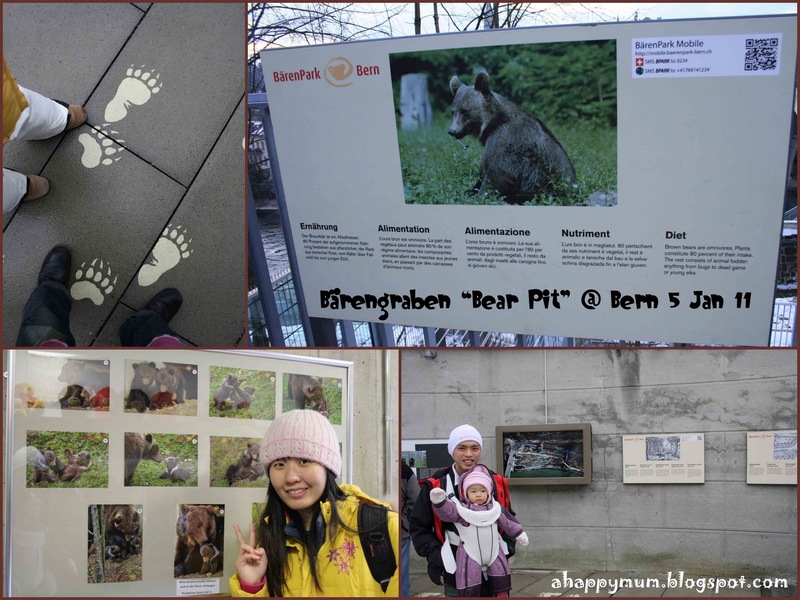 On the second trip, I had a hunch that the bears might still be hibernating since it was in the midst of cold winter. Thankfully, we were able to see one bear though he pretty much slept all the way and didn't even twitch. Still, that meant mummy could fulfill her promise of "Angel, mummy bring you go see bear bear, ok?" which was greeted with much enthusiasm by the excited baby. As we made our way back to the old town, we passed the Aare river and Nydegg bridge, which together with the stunning medieval buildings, formed a truly picture perfect scenery. 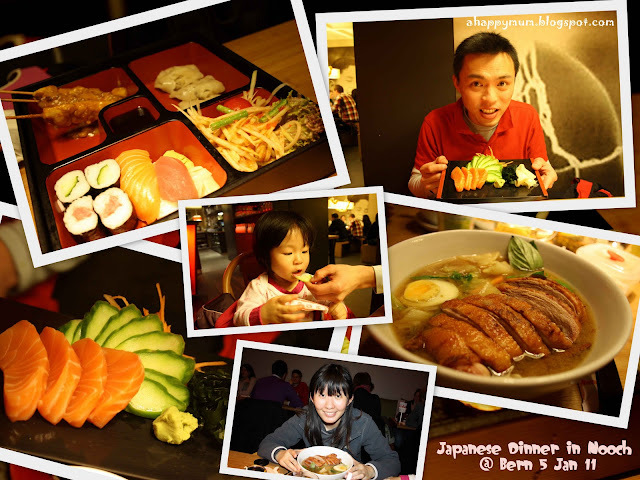 For our dinner in Bern, we chose to dine at Nooch for a Japanese dinner. Jw had a bento set and I had duck ramen. Of course, we couldn't miss out on some yummy salmon sashimi too, could we? It was such a delicious dinner and something that we had missed out on in Karlskrona. Before we ended the night, we took a leisure stroll to the Parliament building. What surprised me the most was that they had an outdoor ice skating rink right at the square! What a cool idea. Not that it could have happened in Singapore since the ice couldn't last even 5 minutes under the scorching hot sun. Somehow, it just made me feel so delighted watching the happy faces of the skaters, especially the kids. Ok, now I just have to wait till Angel learns to walk before I can fulfill my dream of "the loving mum holds on tightly to her daughter's hand as they ice skate side by side with gleeful faces". 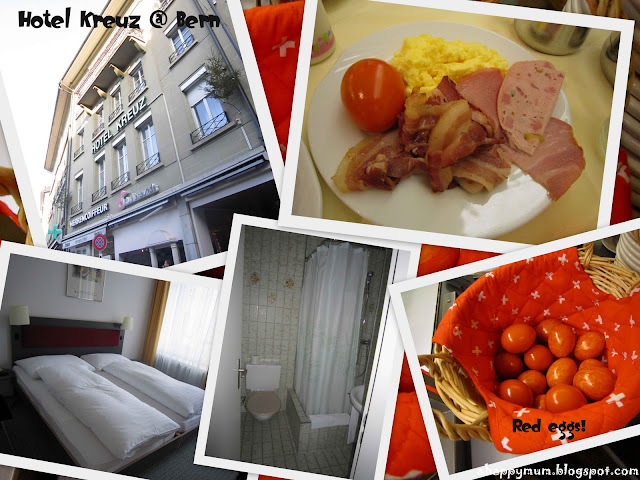 So, that was the end of our fabulous stay in Bern. Thankfully, the rat didn't appear again. When I asked jw which was his favourite city out of the four we had visited in Switzerland, he said it would be Lucerne. Ask me the same question and I would probably be put in a dilemma. I loved all of them so much! 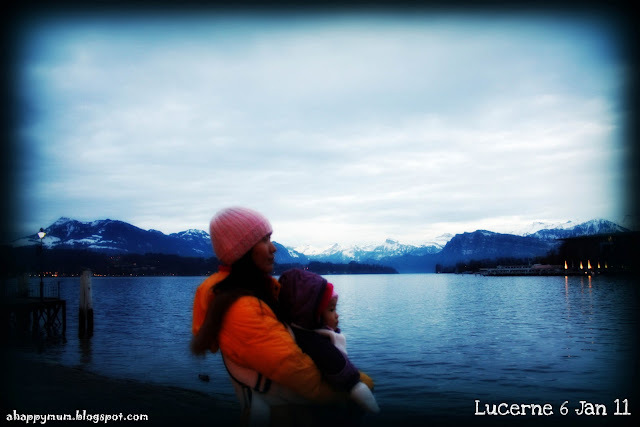 However, if I had to make a tough choice, I would have to say too that Lucerne was the most beautiful of them all. 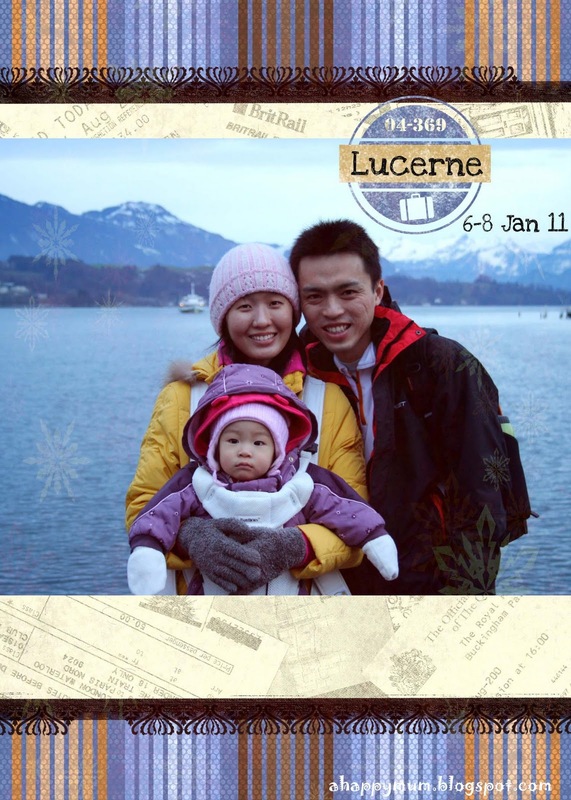 The thing about Lucerne was that once we got out of the train station, we felt like we had stepped into a paradise where we were surrounded by breathtaking views of the Alps. The beautiful, flowing river and elegant architecture only boosted the surreality of this picturesque city. 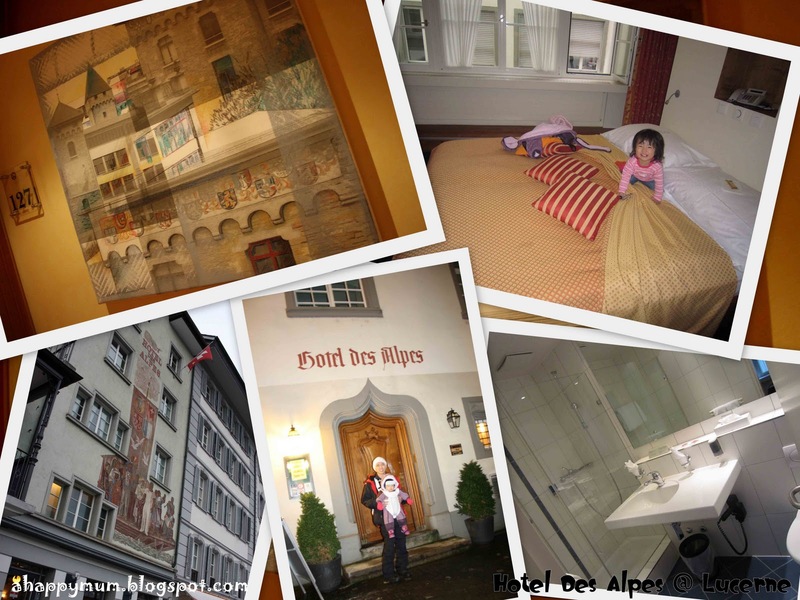 We stayed in Hotel Des Alpes which was conveniently located near the train station. Best of all, it overlooked the Reuss river, the famous Chapel Bridge and the magnificent Alps could be seen too. Well, not from our room since we stayed in the cheapest possible, but once we stepped out of the hotel, all the pretty sights were right before our eyes. It was also just minutes away from the old town. 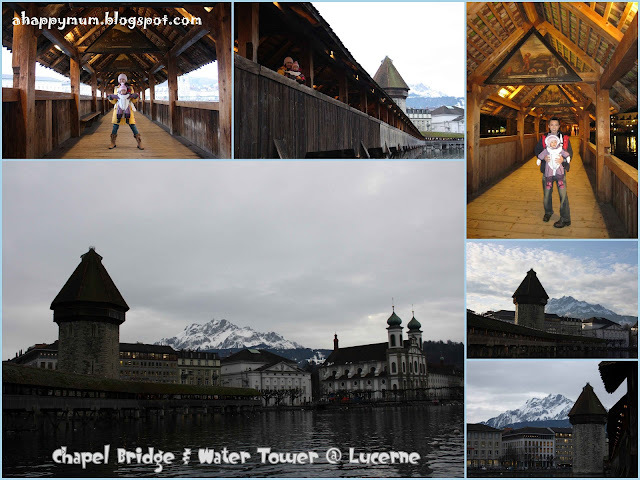 The Chapel Bridge is a covered wooden footbridge spanning diagonally across the Reuss River. The bridge is unique since it contains a number of interior paintings dating back to the 17th century. It is also the oldest wooden covered bridge in Europe, as well as the world's oldest surviving truss bridge. Together with the Water Tower, it has become the symbol of Lucerne and one of the main tourist attractions in Switzerland. We bought a box of Luxemburgeli since they looked really appetizing and yummy. 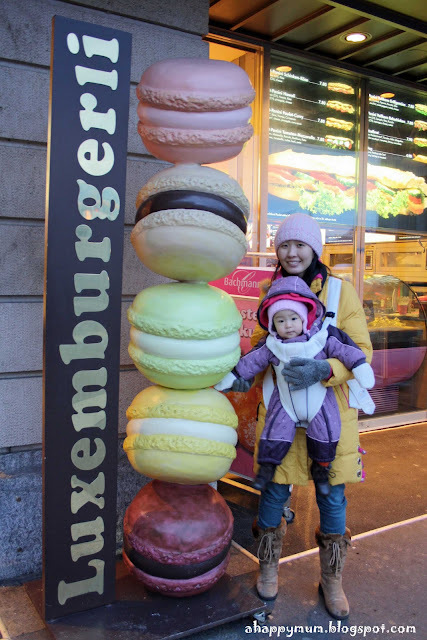 It is similar to a macaron, but smaller, with top and bottom sugar-based confection and cream filling in the center. There were many flavours for us to choose from, including vanilla, chocolate, caramel, hazelnut, mocha, cinnamon, lemon and raspberry. I couldn't say they were finger-licking good as they were a little too sweet, however it was a been-there-ate-that achievement for us. 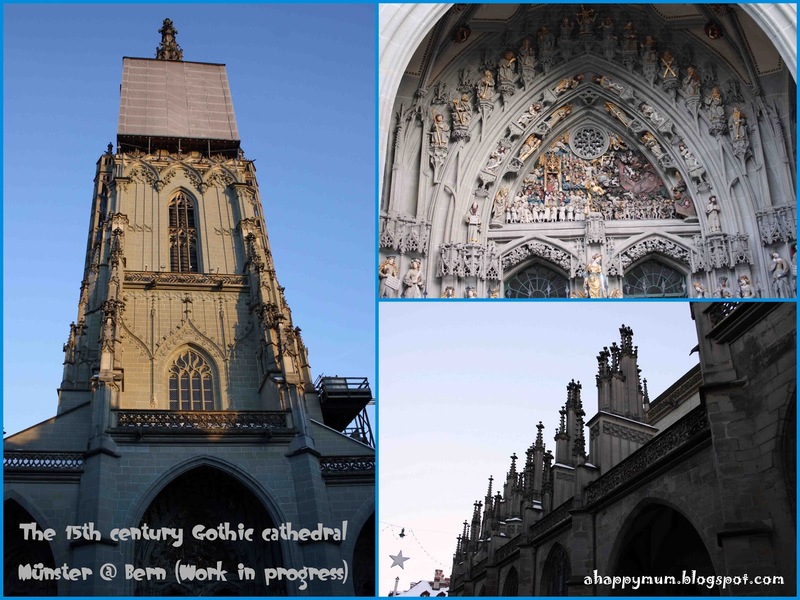 We spent our first day in Lucerne just taking a nice stroll, exploring the old town and absorbing the splendour of the views. Angel's favourite part was probably when we got up close with some ducks and swans and fed them with bread. She usually goes hysterical and screams "Ah duck! Ah duck!" non-stop when she sees these fascinating animals. 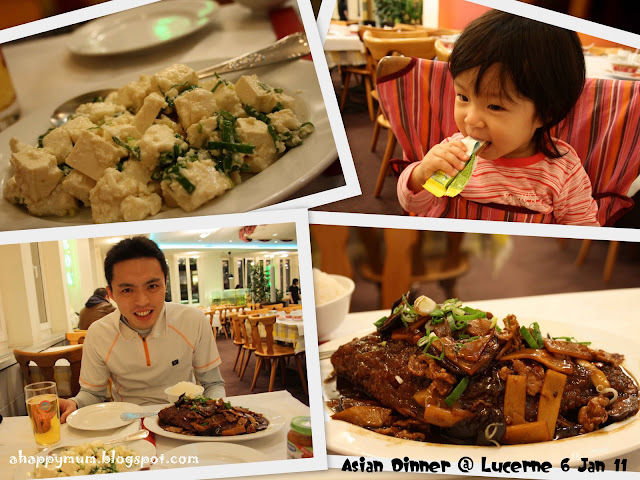 We had a simple dinner in an Asian restaurant which charged rather high prices. So, between us, we ordered two dishes: fish and tofu. Other than that, we used rice to fill up our stomachs. It usually works quite well. The next day, we had our second excursion, this time round to Mount Titlis. 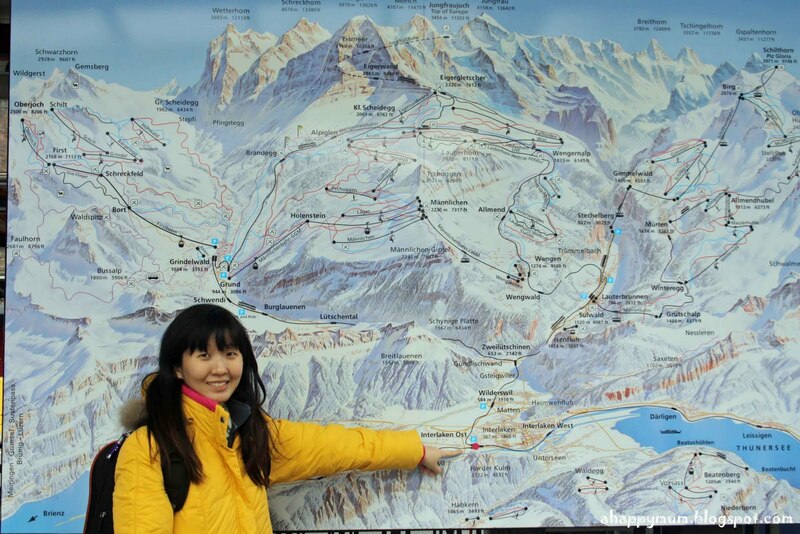 Not only did we have to switch trains, we took a total of three cable cars before we reached the summit. One thing I loved about Switzerland was the efficiency and timeliness of the transport network. There were no delays, no technical faults and no malfunctioning in the span of the week that we were there. 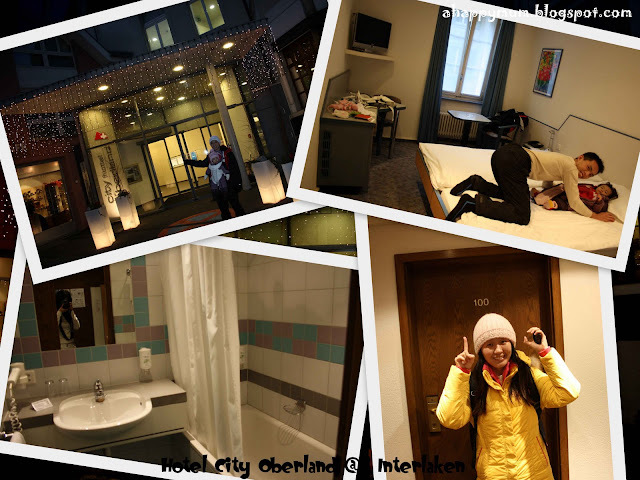 We travelled via second class but I was totally satisfied with the cleanliness and comfort of the cabins and seats. Anyway, the third cable car we took was the Rotair - the first ever rotating cable car in the world. 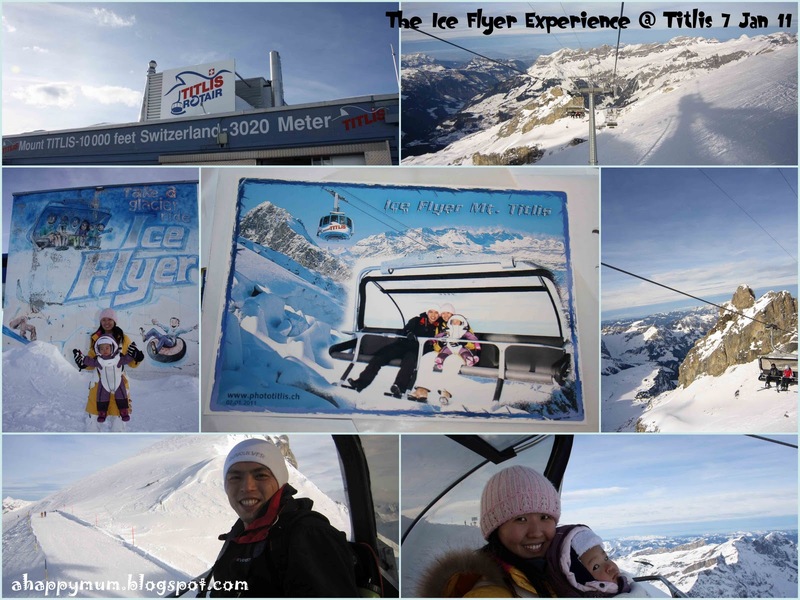 That meant that at 3000 metres above sea level, we were able to enjoy a 360 degrees panoramic view of the snow-capped mountains. Similar to how Jungfrau had an Ice Palace, Titlis featured a Glacier Cave instead. 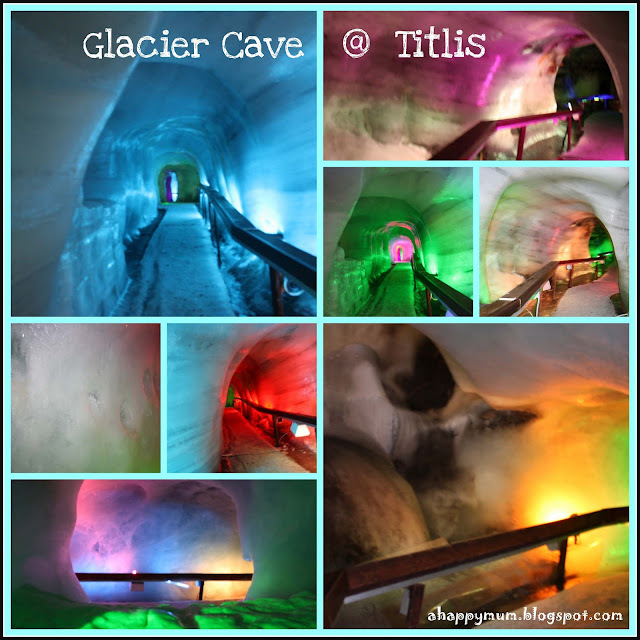 It takes you through a 150 metres long tunnel down to 20 metres under the glacier's surface. 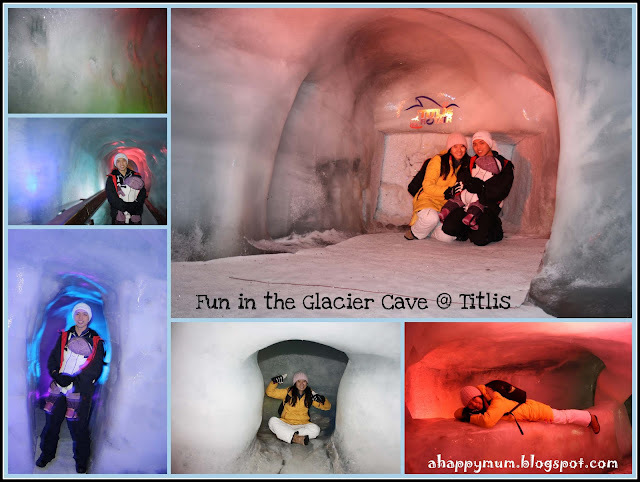 What I loved most was how the 8,450 lamps lit the glittering ice walls in bright, vibrant colours and how we could select the background music, for example pop, rock, classical etc, when we first entered the cave. There was this small little hole that my dear hubby asked me to climb into to take a picture. It was hilarious because I tried many times and never failed to slide down just before I reached the top, much to the giggles of passers by. Well, when there's a will, there's a way. When there was a strong hubby who could let me step on to climb my way up, I eventually got there. Yoohoo! 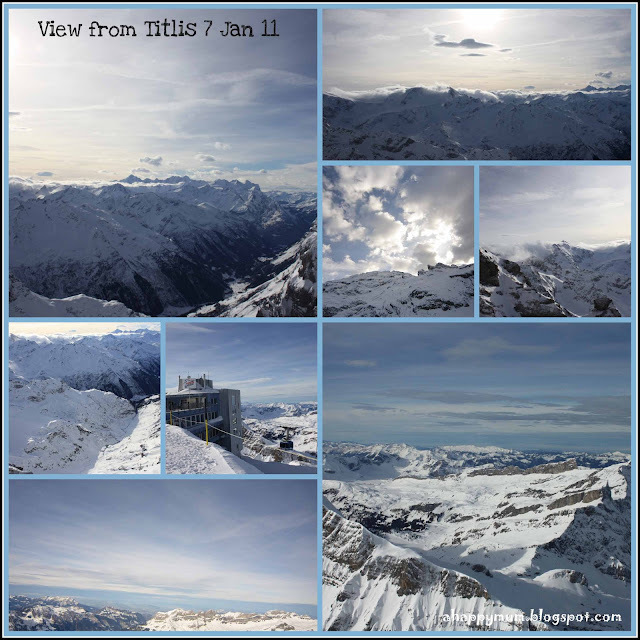 The view of the Alps from the summit of Titlis was once again a magnificent one. Jw made a rather true comment that once you had seen it once, the rest seemed to be more or less the same. 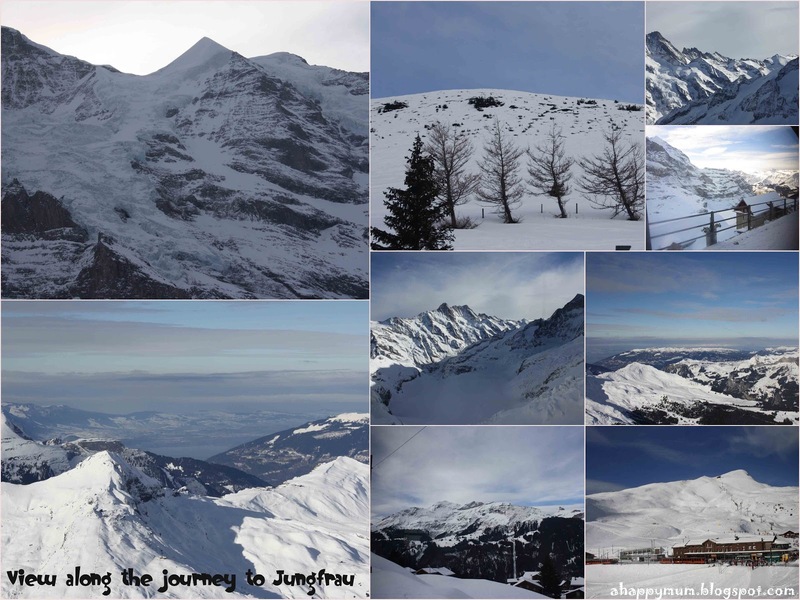 Yes, I did agree that I let out more "Woos" and "Wows" when I was up on Jungfrau overlooking the Alps for the first time in my life. However, it felt great to be right here on Titlis too. 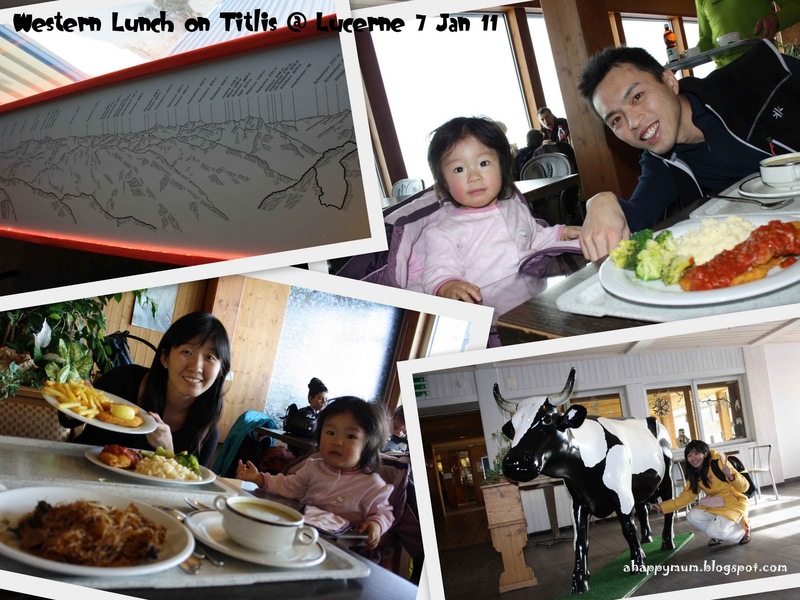 We had an enjoyable western lunch on Titlis, wondering what else would be in store for us for the rest of the day. 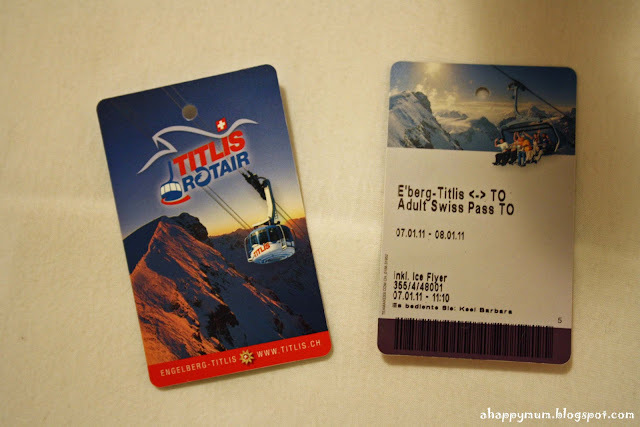 Our tickets allowed us to have a free ride on the Ice Flyer, which we subsequently discovered that it was a chairlift used by skiers. 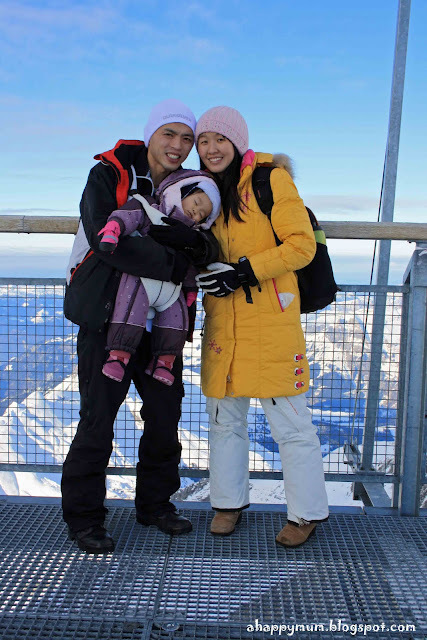 Still, since they allowed Angel to ride it too, it was a memorable first time experience for us as a family - riding through clouds on top of snowy peaks and glaciers. Caution: For those with small children, you should wear a baby carrier like I did so that your baby can be securely strapped onto you. You wouldn't want them to fidget or jump about and end up landing on one of the peaks in the Alps, (no matter how tempting that sounds), would you? Angel looked so cute, and a little cuckoo with the small head and big body, in this picture that I couldn't possibly leave it out. 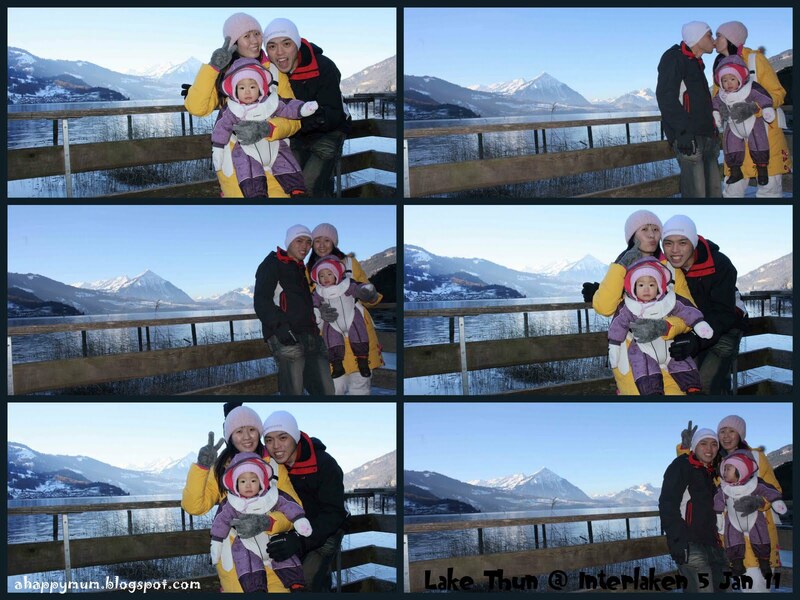 The highlight of our excursion was undoubtedly playing with the snow toys in the Glacier Park. 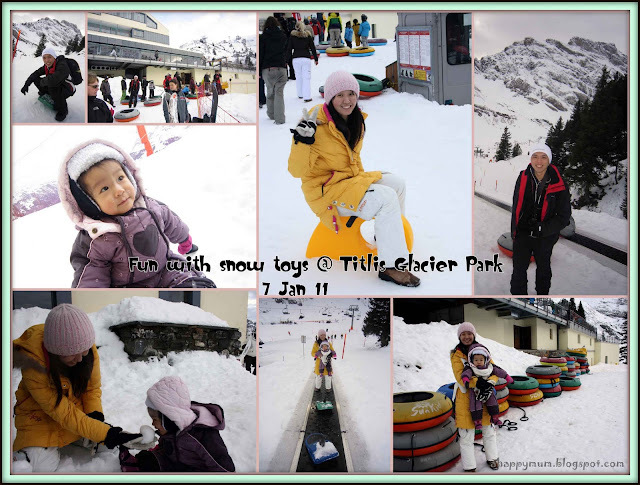 There was a variety of snow toys for us to choose from, from snow-scoots to balancers to snow tubes. Every one of them was a first-time experience for us and well, jw and I pretty much became kids again, exploring every inch of it. The best thing about the park was that they did not have a restriction on the age, which literally meant that Angel was free to try out anything she wanted at the age of 1! Well, I had already concluded that she was a daring baby who loved thrills and she only proved me right on this trip. We did the snow-tube, twice, where you basically sat in the middle of a round tube and whisk down the snow covered slopes in a winding manner. It was especially exhilarating when the tube bobbed up into the air before landing and hitting the snow again. Angel and I also did the snow board where we slid down the snow at an accelerating speed. You can watch it in the video below. 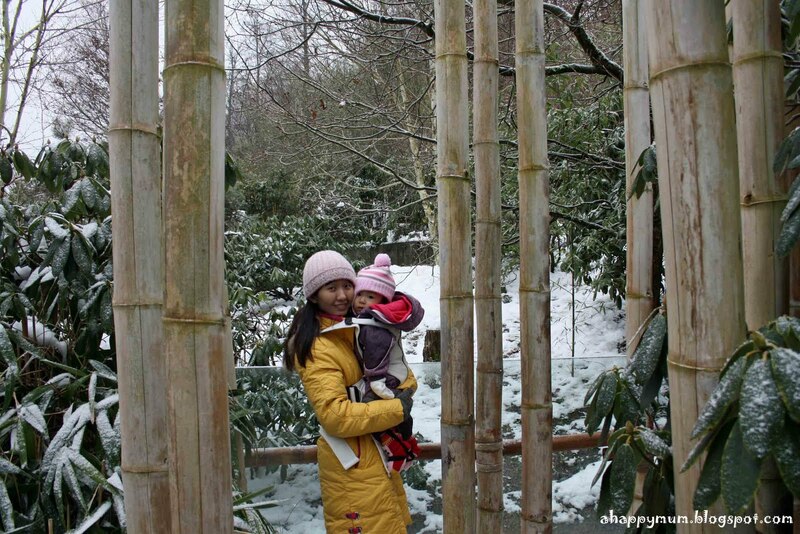 It was totally fun to have been able to play in the beautiful, snowy environment and to let Angel participate in it too. I am quite sure she will have no memory of it, but not to worry, mummy will show you all that you had done when you were just one! 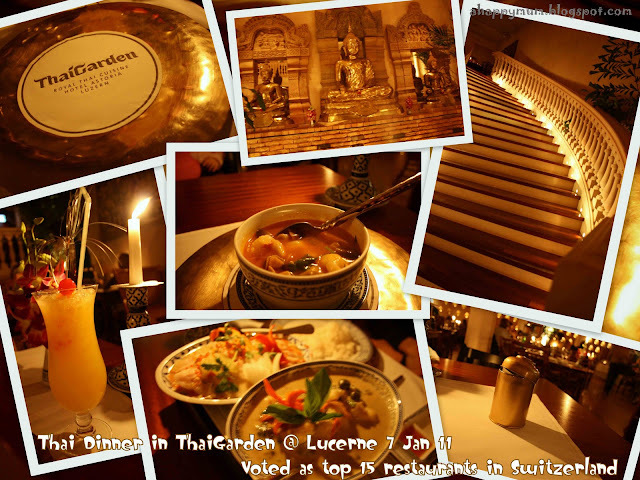 For our finale night in Switzerland, we decided to reward ourselves with a sumptuous meal at ThaiGarden, despite the hotel staff warning us that it was freakingly expensive to dine there. Well, turned out she was right, it was an unbelievably expensive meal, but thankfully, it was a delectable one. It was for reason that this restaurant was voted as one of the top 15 restaurants in Switzerland. 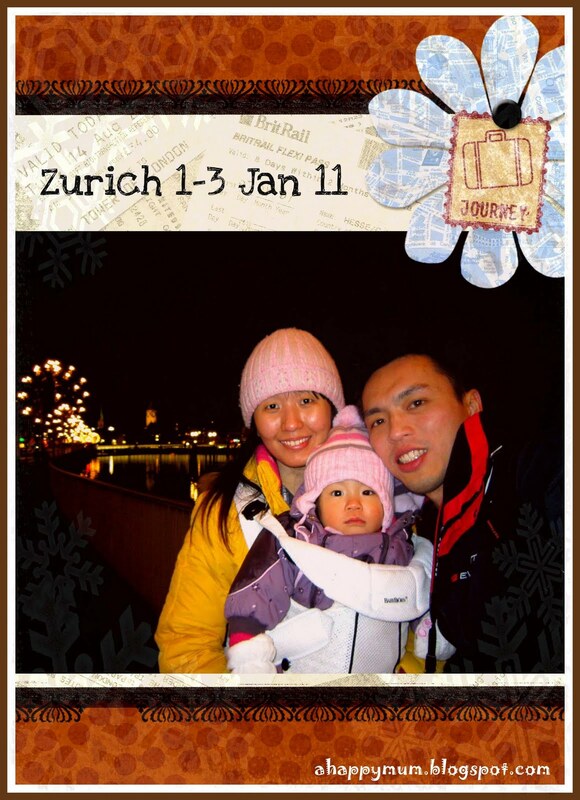 That said, it was finally the end of our dreamlike holiday in Switzerland. This was definitely my most beautiful vacation ever. If anyone is looking for a fairytale-like holiday and is somehow in love with snow too, why not consider Switzerland as your next destination? Just remember to bring along a thick winter jacket even if it is summertime, ok? Check out my video to view the penguin parade, jw playing the Alphorn, us playing the snow toys and more scenery taken of the Alps. Enjoy viewing! I wish i can go back to switzerland someday too! Actually winter means it's harder to carry the baby because each of us has on 5-6 layers of clothes! Haha. But well, we survived and it was one of our most awesome trips! Hi! I happen to stumble across your post. How old was your daughter when you went to Switzerland? I'll be travelling to Switzerland this early December and would like to know how you kept your daughter warm throughout. Can you share with me some tips and what she should wear? My daughter will be 16 months old by then. Hope you can drop me an email at nurul.hannah@gmail.com. Thank you in advance!